Brief word on the legends! You can find the village, in the western Corbieres, by taking the D118 south from Carcassonne and continuing through Limoux and then Alet-les-Bains to arrive at Couiza. As you leave Couiza, (driving slowly!) 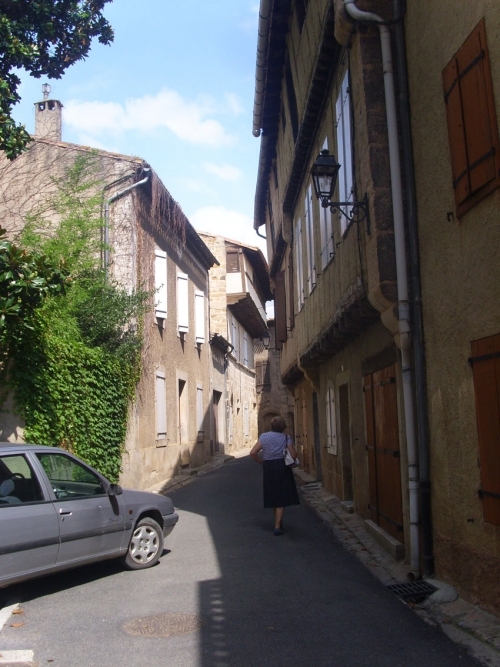 look for a tiny road on the left with an even tinier sign also on the left, saying Rennes-le-Chateau. This narrow winding road, with wonderful views, takes you into the hilltop village. In high summer one parks in the parking provided, but at other times you can drive right through the village to the carpark by the water tower with its fantastic views to the south. The Tour Magdala (above), which has become so symbolic of Rennes-le-Château, can be seen to the right. To the south-east, the village of Esperaza; to the south-west, what once was the lower town, the the gorge where now runs the Couleurs river, and the Las Casteillas, where the Celts used to live in pre-Christian times. The ninth-century lower town (below) has never been excavated. 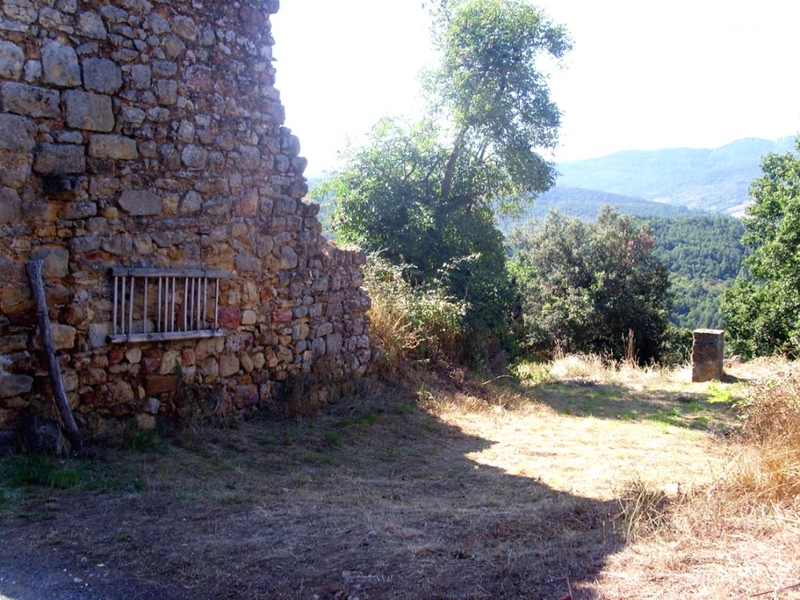 In this view from outside the village, from the south-east, you can see the citadel of Rennes on the right, and the sloping area of land on the left. At one time the citadel, and the lower town, comprised an medieval town bigger than the Cite of Carcassonne is today. The lower town stretched from the citadel to the tower that you can just see on the left of the photo. But maybe you now want to explore the village! leave the carpark and you will see the restaurant, le Jardin de Marie, on the left (see more here) and then Porte de Rennes, the famous book and gift-shop. Then you can turn right into the church garden, then through the arch to the office of tourism. 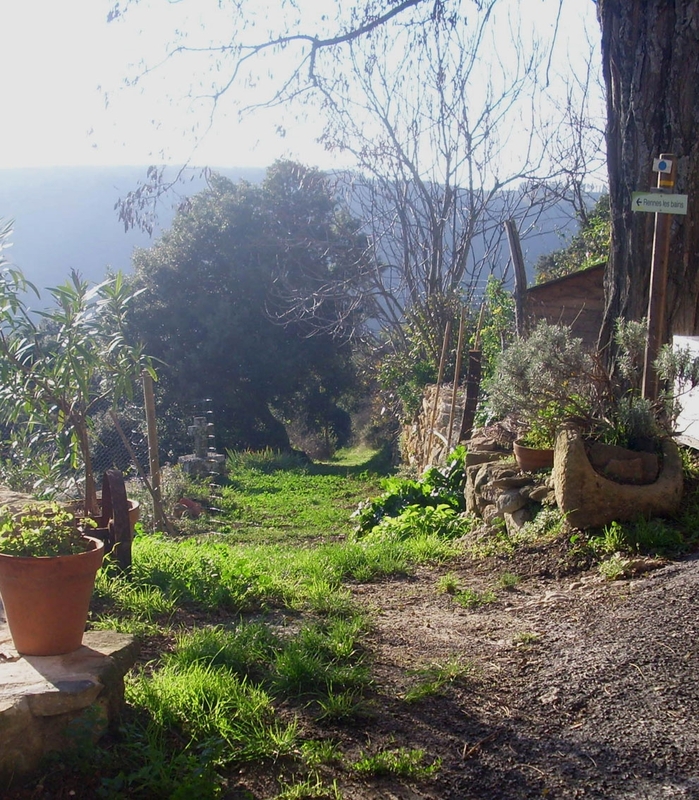 There you can buy an entrance ticket to the museum, the Villa Bethania that Bérenger Saunière built for Marie Denarnaud, the garden with their raised walkway to view the valley, with the Tour Magdala at the end of it. (There will be a separate article for the church.) The château that gave the village it's name? It is on the left as you walk down the hill, beside the Dragon restaurant and opposite the Atelier Empreinte bookshop. It is privately owned so you cannot enter, but is still very picturesque. 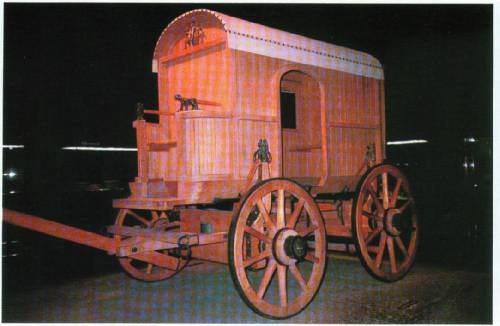 Rennes-le-Chateau was founded in 414AD by the Visigoths and it was called by them "Rhedae" after the covered wagons that they parked in a circle where are now the ramparts. It was Roman, but the Visigoths were quite Romanised, and the richer people decorated their wagons. 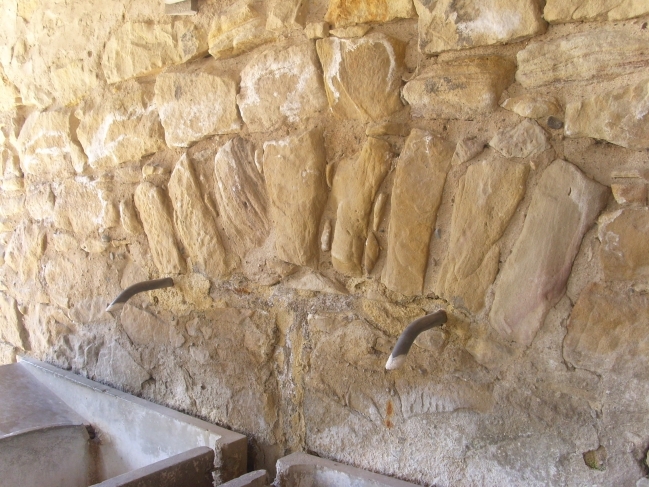 The second picture shows a "rheda" retored by archeologists. In early medieval times Rhedae was the capital of the area ruled by the Visigoths, approximately the same as today's Languedoc region. I feel I have proved this by comparing the Visigothic altar pillar found in Rennes-le-Château with the Visigothic stèle in Narbonne. 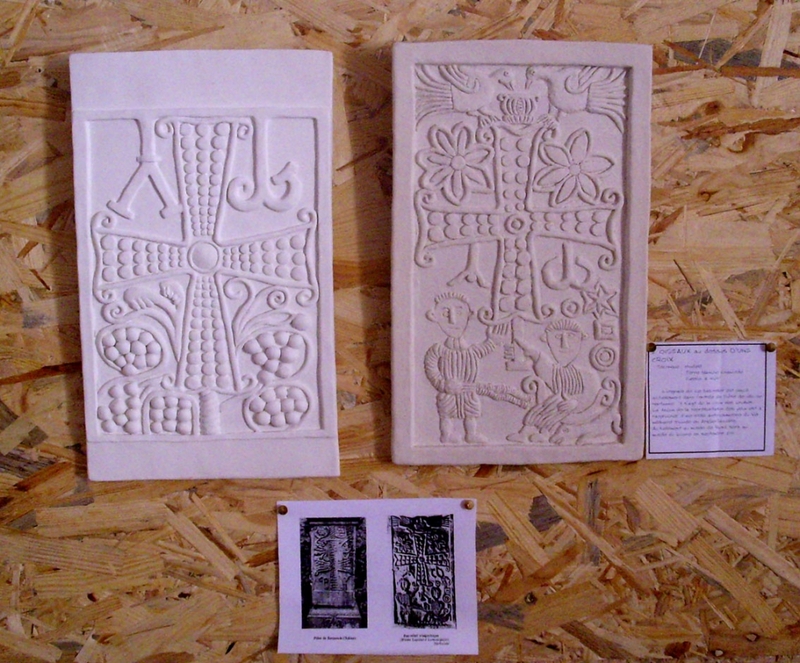 These two plaques were made for me by by sculptress friend Annie Jal from Narbonne, one representing the altar pillar, the other the Narbonne stèle. In their early days the visigoths did not use figures in their art and sculpture. And so the Rennes-le-Château sculpture is older than the Narbonne one. 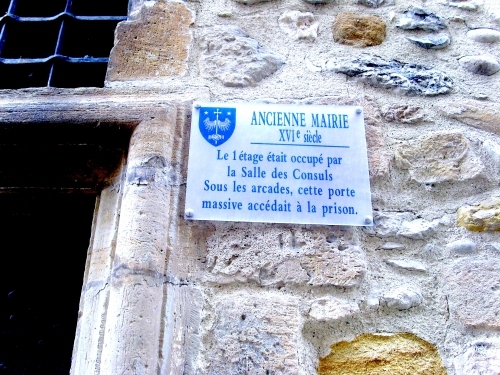 The Visigoths were in Rennes in 414 AD, in Narbonne 462AD. Below is the Knights' Stone, both the original and a rubbing of it - this stone was Carolingian, that is, in the second half of the 8th century. The Knight's Stone. 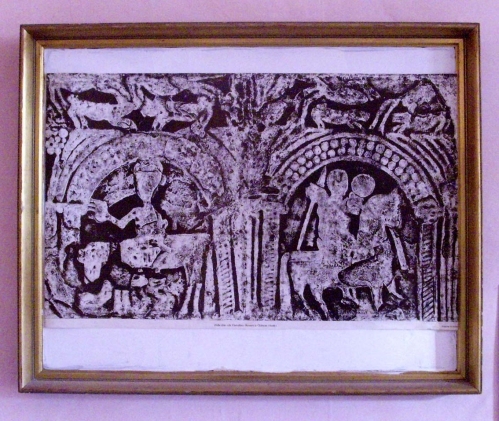 At one time you could buy "rubbings" - I got one and framed it. In the 14th century, due to battles and wars between comparatively small kingdoms; Toulouse, Barcelona, Carcassonne, Beziers, etc, the village and castle was taken by the Spanish in 1362. They left only the chateau, the church of Sainte Marie Madeleine and a handful of houses, and the village was named Rennes-le-Chateau. I recently tried to sort all my photos of RleC (I have visited many times over the last 30 years) and it seemed that not only the museum was always in a different place, but any museum at the time always had different things in it from the museum before! I can remember going into a bedroom in the Villa Bethania; it was set up as a scene of Bérenger Saunière's bedroom. 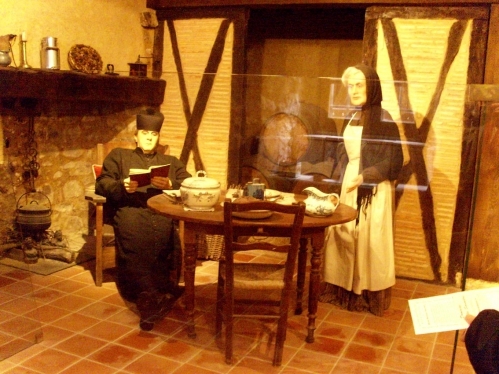 These things are popular in French museums - everything in the room is supposed to be as it was when the person lived in it. Except that Bérenger Saunière never lived in the Villa Bethania. He always slept in the presbytère, the room, in fact, on the right as you go into the door of today's museum. None-the-less, this scene in the bedroom brought a tear to my eye, I don't know why exactly. I remember thinking; "Why can't they let him rest in peace?" Later I found out why he had called it Villa Bethania. I was researching early Christianity and found a document dated 1910. In this document the House in Bethany, the home of Mary Magdalene, Martha and Lazarus, was called the House in Bethania. 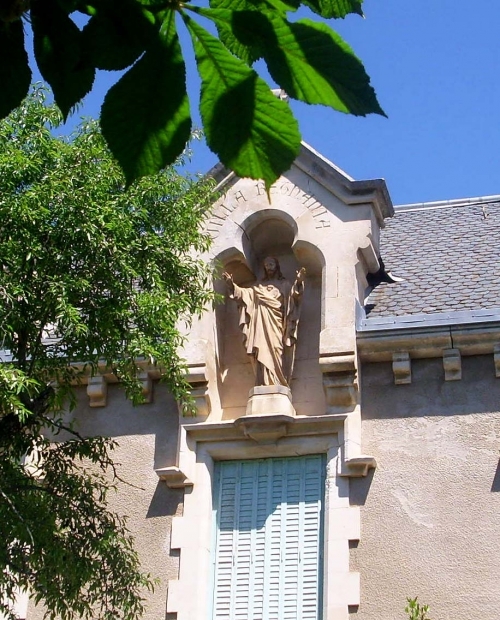 It was the normal name for "Bethany" at that time, Bérenger Saunière wanted his house to be reminiscent of the house in Bethany that Jesus had visited so often. At the time the Church did not believe that Mary of Bethany was the same person as Mary Magdalene, but it seems Bérenger had worked out that she was. At the time of these visits I didn't know how important to my life Rennes-le-Château was going to become so I never took notes. But I remember the museum being in a sort of curved corridor. On another occasion it seemed to me that something I wanted to see, that I'd seen before, was missing; but meanwhile dinosaur's eggs had appeared, which I didn't really think was much to do with our dear priest. The first thing you see, entering the museum, is this "mis-en-scène" of Bérenger being served his dinner. In the early days it was not Marie Denarnaud that cooked his dinner, but Alexandrine, Marie's mother, (as shown here) in the lodgings she provided for him until the presbytère was renovated. 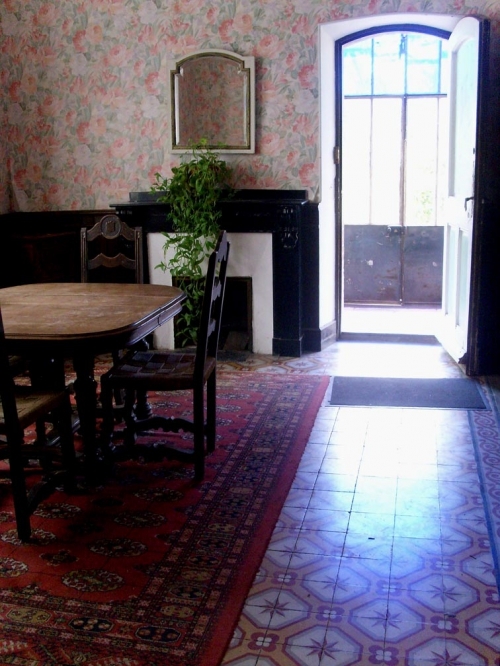 But this scene is in the very room that used to be the kitchen of the presbytère, where it WAS Marie who cooked for her dear priest. 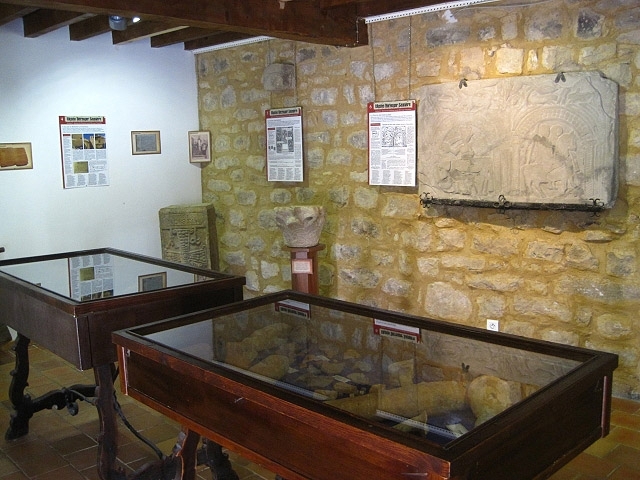 So, researcher's hat on, I delved into the history of the Rennes-le-Château museum. In the late 1980's Henri Buthion owned the domain of Bérenger Saunière - the villa, the park with its belvedere walkway, the Tour Magdala and the garden with its pool in front of the villa - which he ran as a hotel. The presbytère was leased to him by the Mairie. Henri Buthion's finest hour was when he stared in a film about Rennes-le-Château, playing the role of the priest. The film was an enormous success and 50,000 visitors came to the village that year. It was decided that something should be done to accommodate and attract them better, and so the Association Terre Rhedae was born, run by volunteers. The commune decided not to renew the lease on the presbytère to Buthion and so they rented the presbytère to Association Terre Rhedae. 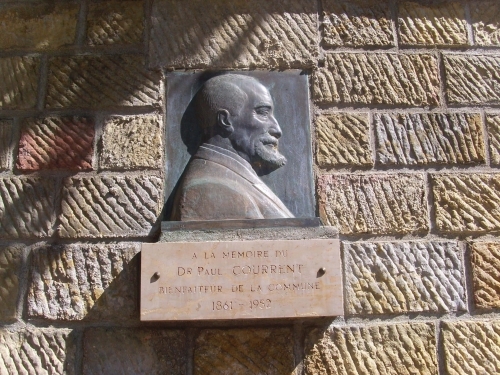 The first museum opened the following year, based on the abbé's inheritance in the hands of Claire Corbu and Antoine Captier. 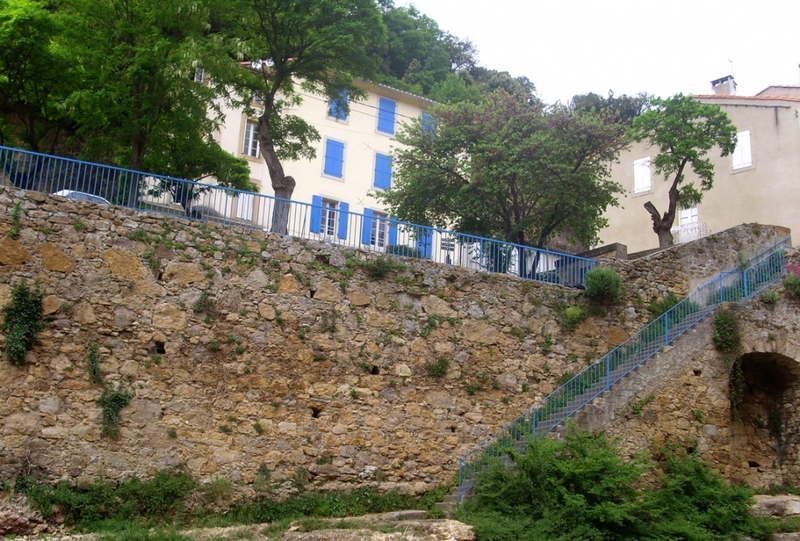 Claire is the daughter of Noel Corbu who bought the villa from Marie Denanaud. After the success of The Holy Blood and the Holy Grail, a major work about the mysteries published in England, the number of visitors to the museum in the presbytère increased rapidly, and so did the facilities. Antoine Captier shared anecdotes about the priest with the customers; his grandfather was the bell ringer who was there when Bérenger found something in the wooden pillar from the Renaissance altar rail. His wife Claire came on Sundays. Marcel, his younger brother, with his nephew Michel, worked on a strip cartoon telling the legend - you can still buy it in the Porte de Rennes. Celia, Marcel's English wife, explained everything to the English visitors. It all became quite lively. 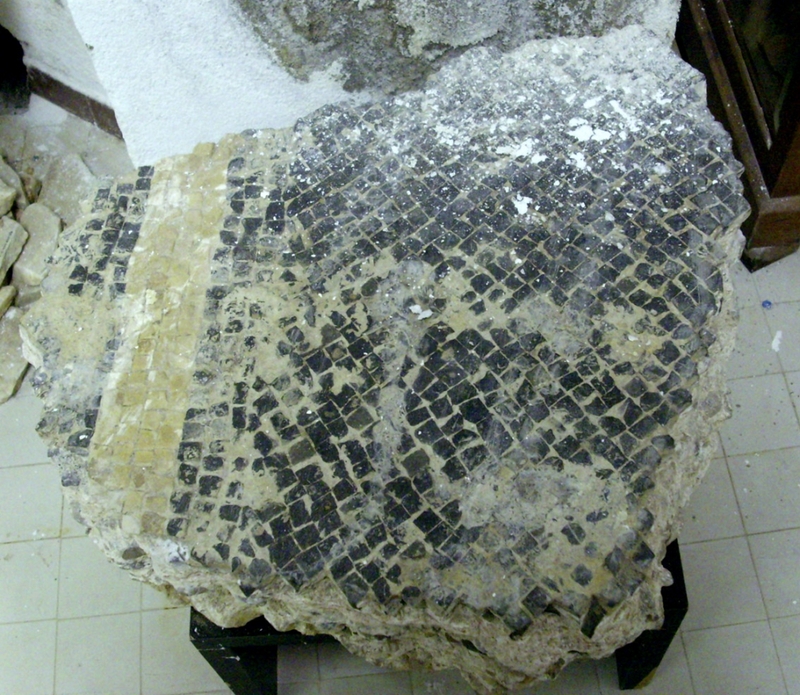 The original Visigothic altar support in the museum; it's "twin" had never been found. Some say the Visigothic pillar at Rennes-les-Bains was its twin, but the design is not at all the same. Besides, sometimes the alter slab was supported by only one pillar. 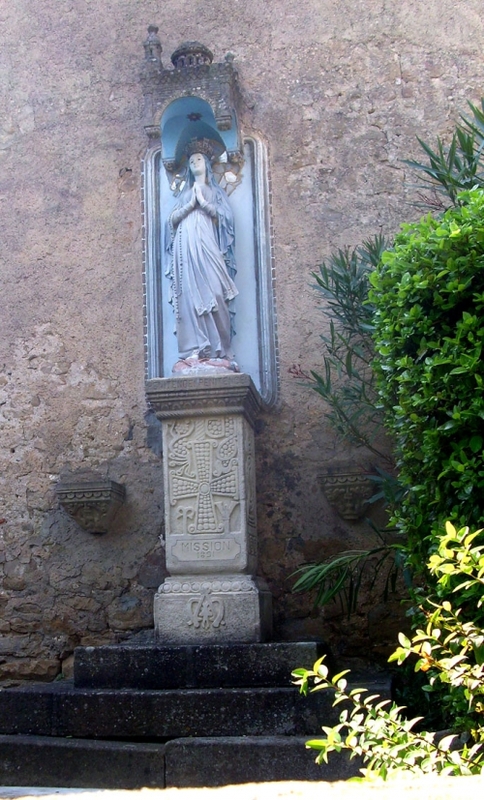 The pillar under our Lady of Lourdes in the church garden is a copy, but upside-down as Bérenger placed it. In Autumn 1992, during a week of lovely fine weather, the Marie decided to repair the roof of the presbytère roof. Scaffolding was erected and old tiles taken off. A tarpaulin had been put in place for the weekend, just in case of rain. Unfortunately a storm blew up, it rained heavily, and there was a flash-flood in Rennes-les-Bains. The presbytère of Rennes-le-Château was completely flooded. The items in the museum were rescued because now the whole building would have to be renovated. The work was done but during it many things disappeared. Nothing remains of any original decor from the time of Bérenger, nor the stonework of the original door into the church, which was blocked when the presbytère was built in the eighteenth century, (a plaque on the wall says 1727) leaning against the church, and a new church door was made, where is now the church porch. If the building was a museum, you would think they would have left visible the stonework of this door, in the room on the right as you go in, the room that was once Bérenger's bedroom. 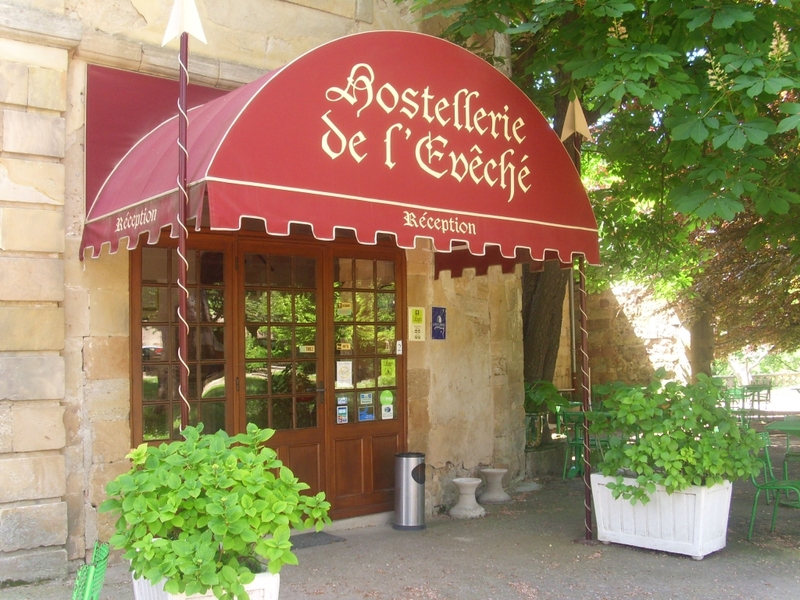 In 1994 Jean-Luc Robin, a restauranteur, came to Rennes-le-Château to run the domain on behalf of Dutch/American owners. In 1997 a trench was dug across the park to link a new kitchen to the drains. Two metres down (that's quite deep, deeper than the tallest man, deeper than the statuary depth for sewerage pipes) the trench cut across remains of some very old walling, and between these two walls were found "some skeletons", pottery fragments dating from the 3rd century BC to the 3rd century AD, an Iberian coin and a fragment of Greek vase of some archeological interest. To Jean Luc this confirmed the village had been an important Iberian oppidum. He put these pieces in a glass display case. 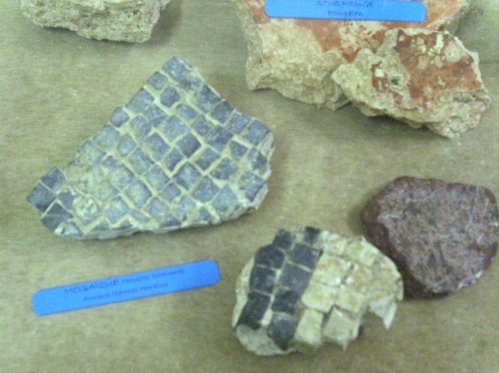 An archeologist friend identified them and made proper labels before they were put on display. Another friend, a regular diner at his restaurant, gave Jean-Luc some Roman tokens he had found near Narbonne while working on the vines. Care was taken no-one thought these were found at RleC. I am a bit sceptical about this story from Jean-Luc Robin's book. The Romans had settled at Rennes-les-Bains, not Rennes-le-Château, and the oppidum is in today's commune of Rennes-le-Château but was not where is the citadel village today. Jean-Luc Robin also tells us that the bits and pieces he found were "commandeered" by the Mairie, after they were wrongly identified as valuable. I'm not sure. The museum as it is today. Noe the Knight's Stone on the wall. Meanwhile, Jean-Luc Robin had become friendly with Claire Corbu and Antoine Captier. Exhibits included the wooden pillar, the priest's clothes with a monogram ( it was very fin-de siècle to initial everything, houses, gates, and so on, which is why the BS on the baptismal font represents BS's initials.) Then there were his beautifully embroidered priestly vestments. His personal possessions - a pen, a prayer-book, a walking stick, a complete set of the picture postcards he had published, plus lots of papers, including Marie's will naming Noel Corbu as her heir. It looked good. Antoine had told the Terre de Rhedae museum that he would be leaving them within the month and would be needing his things for a new museum. The Association promptly photocopied everything. So in the two museums in the village, one showed reproductions, the other showed the genuine articles. Jean-Luc renovated the two ground floors rooms of the Villa into a salon and dining-room, furnished with genuine pieces, some of which had belonged to Bérenger, and renovated the chapel Bérenger had built when they appointed another priest over him. The museum and the visits to the domain were all a great success. But - rivalry was established with the Terre de Rhedae. Then the bickering and in-fighting that started to depress him, he wrote. He offered his landlords the chance to sell the domain. Jean-Luc Robin had to leave. In spite of tight filming schedules, his friend Henry Lincoln kept him company right up to the last minute before his departure. However, Rennes-le-Château pulls us all back - Jean-Luc returned in 2001 and re-opened La Table de l'Abbé in the garden facing the Villa Bethania. I was at Rennes-le-Château in the summer of 2000 but didn't go into the museum. The lady in the tourist office came to lock up the church and dusk was falling. She kindly waited a moment to allow me to photograph the devil holding up the font and told me she was English and lived a little way down the hill "to get away from all the politics." She also said the commune was going to buy the domain, which they did, before the end of the year. Today the museum is firmly bedded into the presbytère and run by the Mairie. It's well done and interesting, and there's often new things that weren't there before. 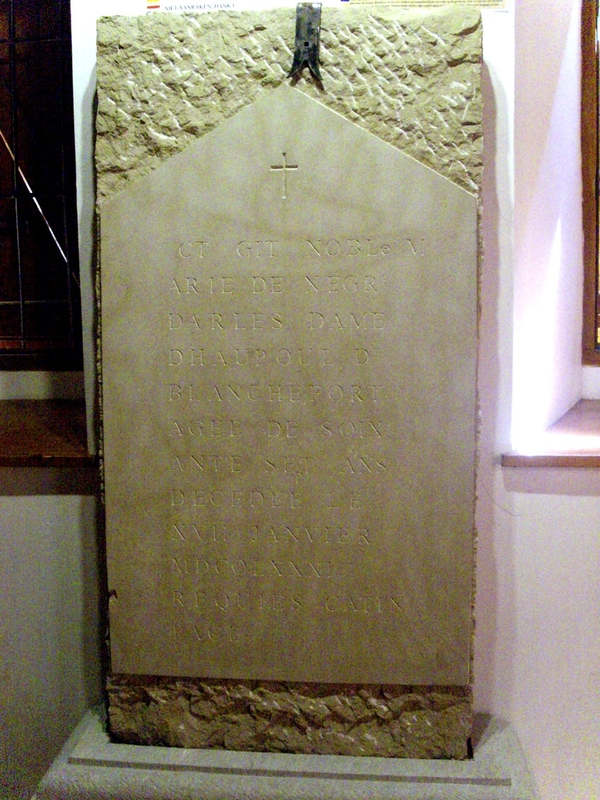 I was intrigued by a facsimile of Marie d'Ables tombstone - and a notice about a tombstone for a two year-old boy, her son. With him the Hautpoul line died out, only a daughter followed, who married into the Fleury family of Rennes-les-Bains. (The daughter had several names, confusing many who decided she had had several children who squabbled over her money, which she left to Abbé Bigou instead. Not true.) When Marie Marie d'Ables died she left the château to her daughter and some personal wealth to her parish priest, Antoine Bigou, who left it all behind when he fled the Revolution. One has to pass through the Tourist office to get to the museum. 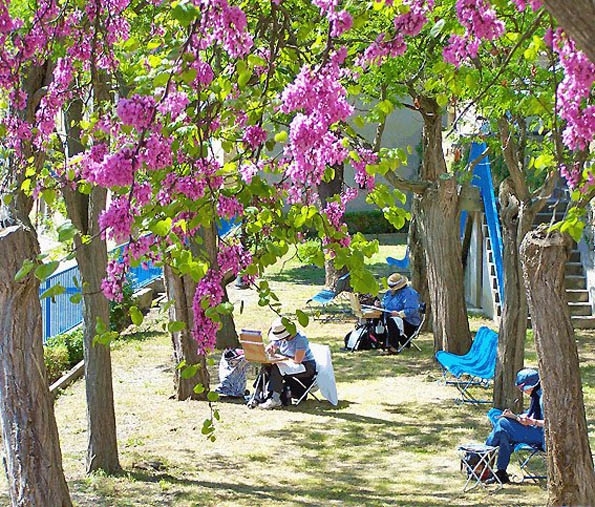 The small entrance charge includes the museum, the Villa Bethania, the chapel, the park with Bérenger Saunière's grave, the belvedere with it's wonderful views and the Tour Magdala. The church, now a listed monument, is open all day, no charge, but the cemetary is closed. And the museum is STILL changing! During my visit in September 2011, I found that the facsimile of Marie de Négre d'Ables tombstone had disappeared, and a new beautifully executed marble stone had appeared in its place, looking nothing like the original one. The legends of RleC insist that Berenger Sauniere himself destroyed this tombstone because the secret coded message on it would "destroy the Church." But that is not true. A treasure hunter smashed the tombstone a short time before 1990, for a photograph exists of the pieces, long since disappeared, in the ossuary in the graveyard. And a drawing exists made by SESA - Société d'Etudes Scientifiques de l'Aude - who visited in 1905 and published the drawing in 1906. They drew it because they were amused at the lack of skill of the mason; whoever carved obviously did so from something in Latin written on a sheet of paper that the mason couldn't read or understand - don't forget, this all happened before the Revolution, in the late 18th century, when many people could not read or write. (Rennes researchers don't believe this can happen, but I once went to a funeral in England to find the family in tears because the mason had spelled the family name wrongly on the tombstone.) It looks to me as though this second version of the tombstone is taken from the SESA drawing. Perhaps the most intriguing find of Rennes-le-Chateau is the so-called Celtic Altar, a huge slab of sandstone which used to be in front of the Mairie. 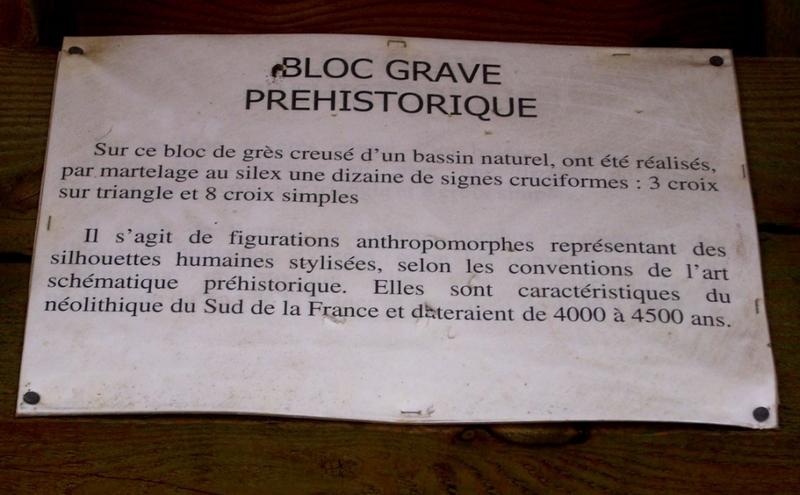 The notice above tells us that it is 4000 years old and carved with several cruciform crosses - nothing to do with Christianity, but thought to be simple representations of human beings, typically neolithic in the south of France and dated 40000 to 45000 years old, that is, about 25000BC. 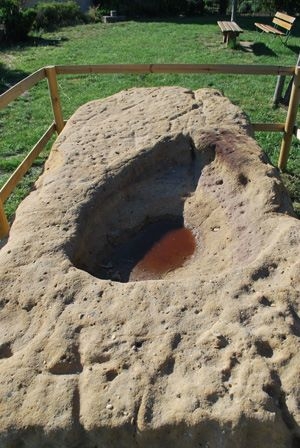 On top of the slab is an indentation which led to the story that the stone was an altar on which live sacrifices were performed. Then another legend arose; because it was found near the cave called Mary Magdalene's cave, and the stone had crosses on, it was something to do with Mary Magdalene. 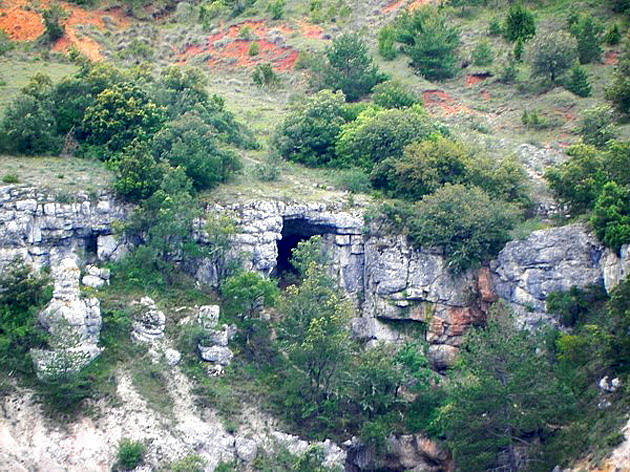 But the cave was only named that around 1980 by the psychic lady who lived nearby; the local people still call it the Grotte de Fournet, meaning little oven. (Click here for more info.) Always with Rennes-le-Chateau, one mystery leads on to another . . . . This stone has recently been moved to a place where more people will be able to see it, just in front of the Tour Magdala. It seems to be a rather rough sandstone; I'm amazed the crosses have lasted so long . . . The Legends grew wings . . . In 1885 the priest Berenger Sauniere was posted to Rennes-le-Chateau and started to renovate the church there, dedicated to Mary Magdalene. 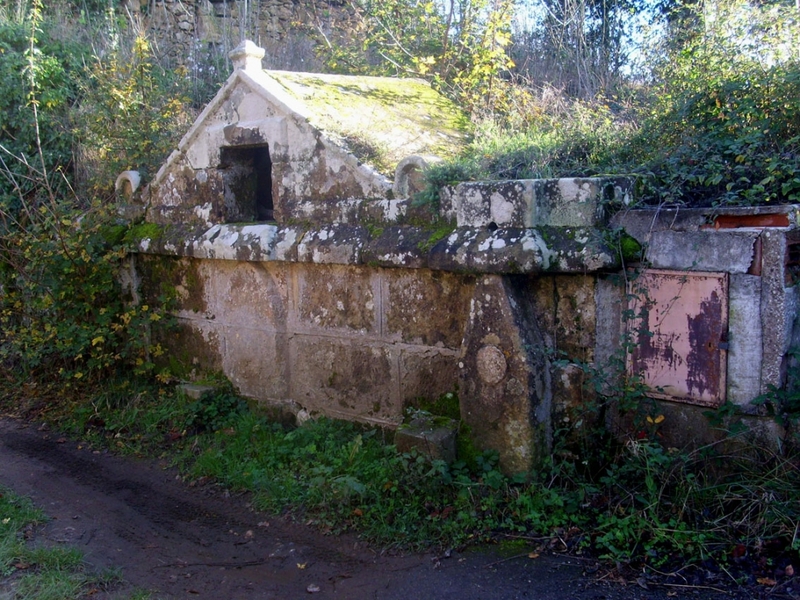 He found, among other things, Visigothic graves in the crypt. He became very rich, constructing a new house with gardens and a tower. Nobody knows where the money came from . . . but some of us have a pretty good idea. Many people who visit Rennes-le-Château are on a Quest for the Secret or the Mystery, which involves great wealth. The Treasure! At Rennes-le-Château, we're told, clues have been left by the priest that only the most brilliant person can solve. He who passes all the tests, who moves successfully from one clue to another, will find the treasure. This story is so powerful that people return to it, time and time again, almost against their own will. It's basically a Holy Grail legend. Grails are often connected with mountaintops. Do people honestly believe they can follow clues and find a treasure huge in its world-shattering importance? Some people think the "discovery" of a bloodline of Mary Magdalene and Jesus proves the Church was lying all the time, and that the Vatican will give people money to keep quiet, because if the story gets out, that the Church is built on a lie, then people will stop believing. No treasure has ever been found at Rennes-le-Château just as one never comes to the end of a Grail quest. The atmosphere there is buzzing as people compare their discoveries, both physical, emotional and spiritual. It would be dreadful if anyone ever found anything and the mystery was solved! But the place is truly magic . . . . The First Day Of Summer - and a cure? In May 2010 my friends, Jean and Marie-Noel, kindly took me to Rennes. We arrived just after noon, so lunch was the first thing on the menu. 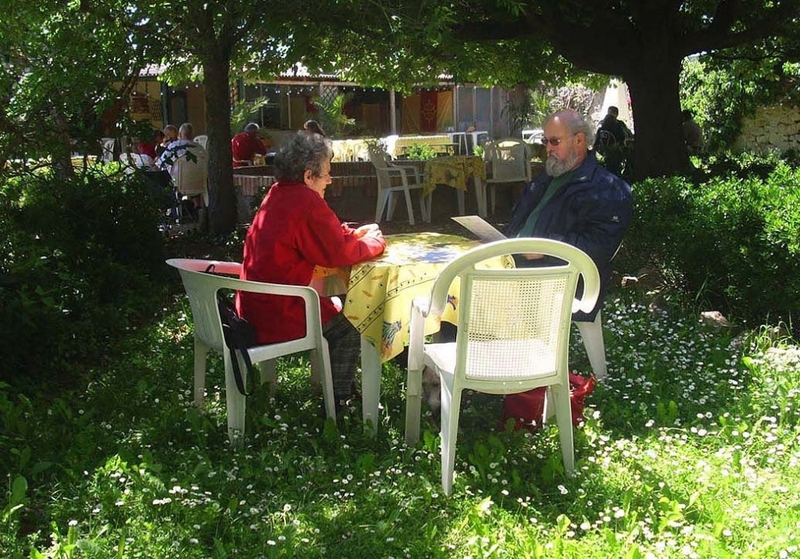 We left their little dog, Cabriole, in the car, because she was fragile after being ill for some time, but the kind atmosphere in Le Jardin de Marie, and the kindness of the staff, meant Cabriole could come with us and sit under the table waiting for titbits. 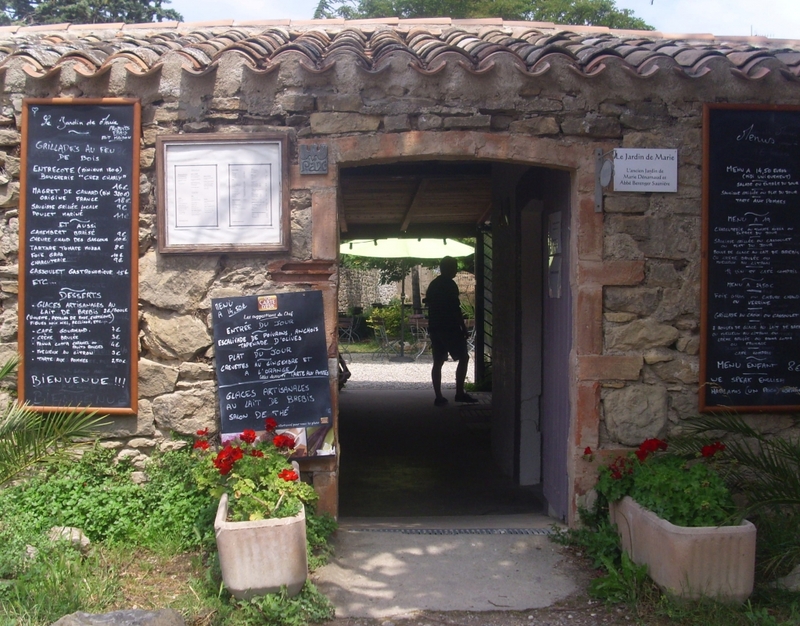 The four of us enjoyed smoked Salmon, a beef stew in the Camargue style (cooked in red wine and very tender), tarte au citron, wine and coffee. We were able to look up at the face of the Villa Bethania - and the face of Jesus - as we ate. A couple of days after we got home, the little dog started to get better and within a week was completely back to normal. "It's as though she has been resurrected," said her owner Jean. "Really - like a miracle." A coincidence? Or had the "vibes" of Rennes, Jesus and Berenger Sauniere conspired to cure a little dog? Certainly, Berenger and his companion Marie, loved animals, Bérenger always asked after them in his letters when he was away from home. tel 04 68 20 99 71 Meals and snacks available all day. See more here. Les Labadous, just to the south of Rennes, offers studios, a lovely restaurant in peaceful surroundings, beautiful gardens and an unique atmosphere suiting this mystic area. The owner has found much "energy" that manifests itself as circles of light on photos, invisible before the photos are taken. These are called "Orbs." Now in 2013 he has written a book about Orbs. Click here for further details. 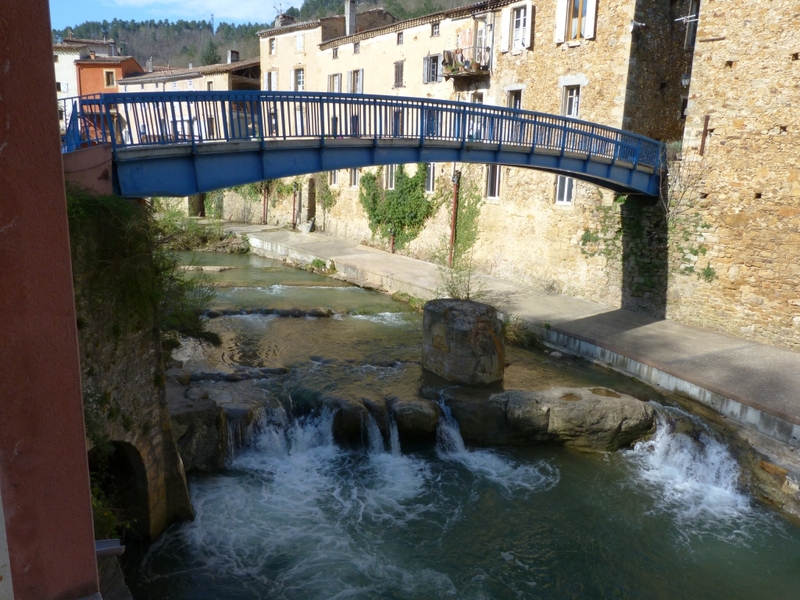 Rennes-les-Bains is some 15 km to the east of Rennes-le-Chateau - one has to descend into Couiza village, then turn right to cross over the river, then turn right again for Rennes-les-Bains. 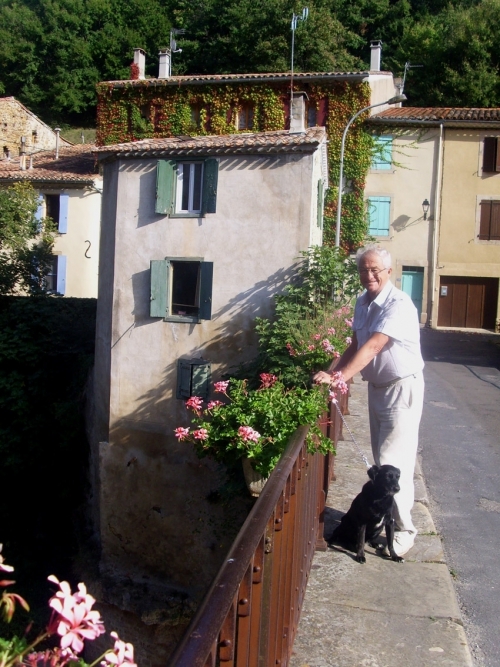 Interest in the village began with the explosion of the Rennes-le-Chateau mysteries, because the priest of "les Bains," Henri Boudet, was a great friend of Bérenger Sauniere, and made many financial contributions towards the restoration of the church. 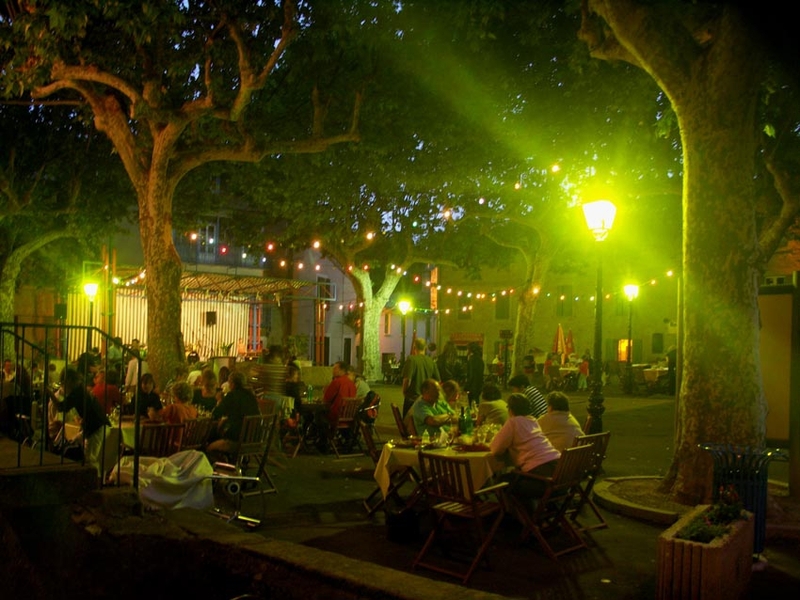 Now the number of people researching and enjoying Rennes-les-Bains is increasingly steadily and the village is becoming fashionable. 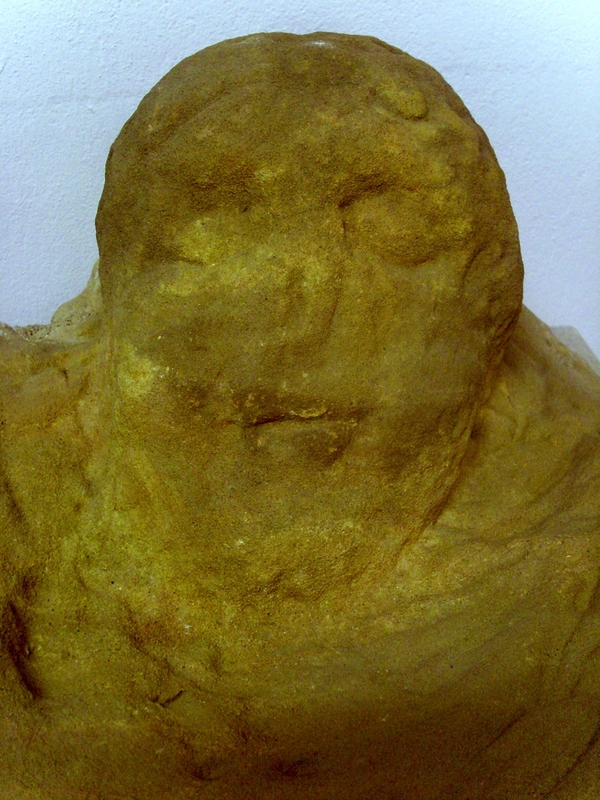 It is especially associated with Pierre Plantard and Mary Magdalene. The town was founded by the Romans about 45BC, they came looking for mineral wealth - salt, tin, iron - and discovered the thermal springs. The first they exploited was the one underneath the Hostellerie, the large pink hotel by the river, and the second, with an incredibly luxurious suite that the Emperor Augustus used to visit, where is now the Bains de Reine, with their new swimming pool built over the Roman remains. 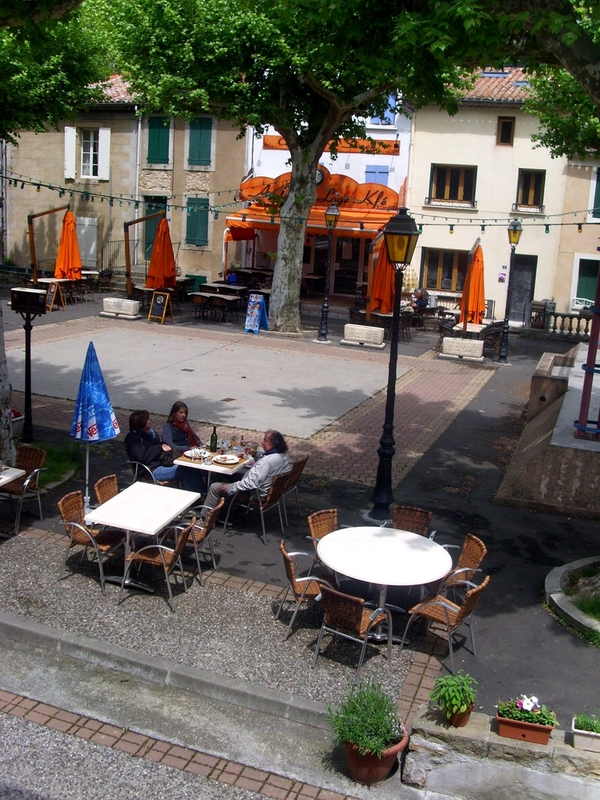 The "Place de Deux Rennes" was originally the Roman market place, while across the road was the Roman Forum. Contrary to popular belief, the name "Deux Rennes" for the place does not refer to the castles and the baths - Rennes-le-Château and Rennes-les-Bains - but to Rennes-les-Bains and Rennes in Brittany, with which Rennes-les-Bains is twinned. Even so, this second picture was called the two maires of the two Rennes! 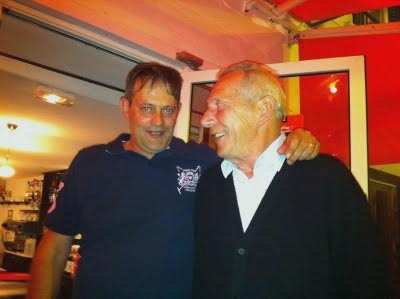 Les deux maires des deux Rennes! The Garden of Paul Courrent is near the bridge in our first picture and is a delightful riverside spot. He was a friend of Bérenger Saunière, a doctor and wine-maker, who wrote a book about the history of Rennes-les-Bains and especially its baths. 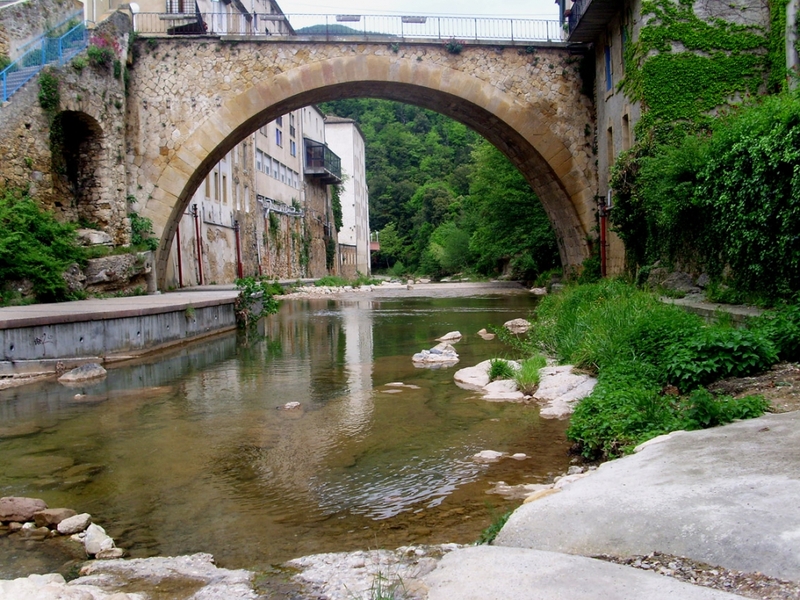 Cross the old "Roman bridge" to look back on the Jardin de Paul Courrent and the river Sals. The bridge is not Roman; the original Roman bridge, all except a small part of it, was situated where is today's blue painted passerelle. You can see the remains of the Roman stanchion beneath it. On Sunday 6th September 2009 I went with my friend Patrick to Rennes-les-Bains and I very much wanted to see Montferrand. I had an idea the Romans lived there before they lived in the valley below with the famous baths. We saw clear blue skies and the temperature rapidly rising to 27 degrees. The views were tremendous, you could see for miles, and the hamlet faced south; the Romans liked to build on south-facing slopes. 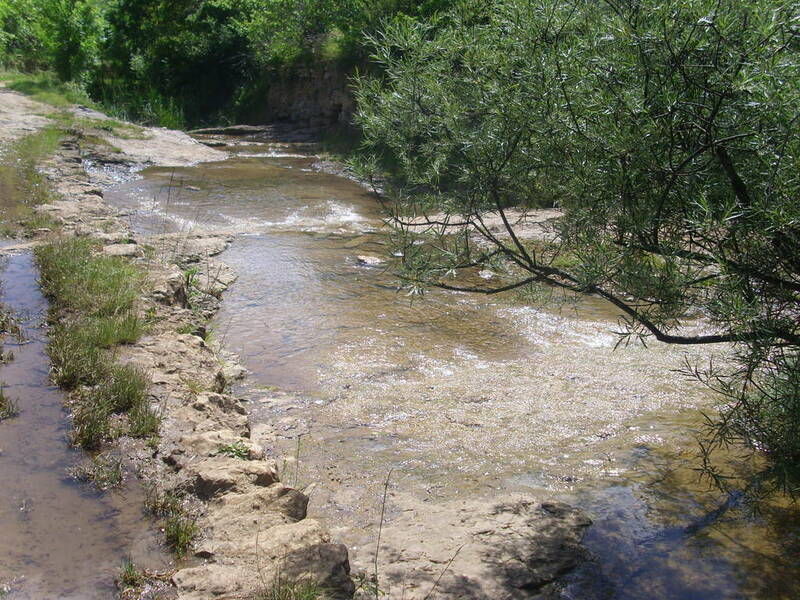 There was also a natural source of fresh water, which the Romans would have liked, indeed, had needed, for the River Sals in the valley was salty. 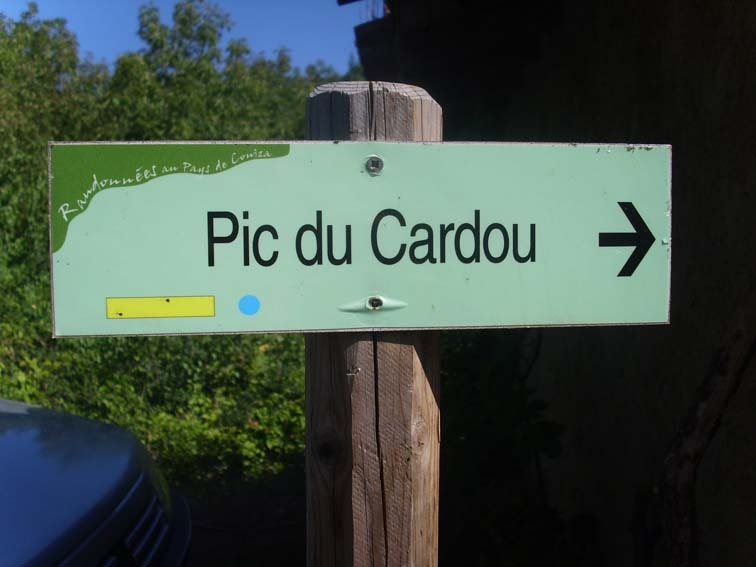 The main attraction of Montferrand seemed to the path by the water source, up to Mont Cardou, which many people think contains, somewhere, the grave of Jesus. On top of Cardou are stones laid out in the shape of an Occitan cross. At one time these stones were in the shape of an arrow, intended to guide UFO's! They had been placed there by teepee-dwellers that the local people considered more than a little weird, so when those people left Rennes-les-Bains, the local people made the stones into an Occitan cross. 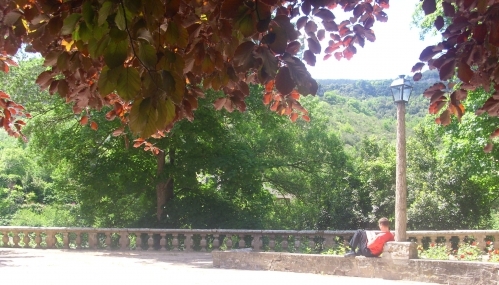 In 2011 I began researching for my book about Rennes-les-Bains. (Here.) There was a ruined chateau at Montferrand, marked on the map. But who had lived there? Then I found some Births, Marriages and Deaths documents of the seventeenth and eighteenth centuries; to my surprise Montferrand was bigger than it is now, as was Sougraigne, and the people used to walk or ride between the two, especially the shepherds. Montferrand was certainly inhabited enough to support the building of a lavoir, or washing place, for the use of the village women. The old water source and the lavoir. The hamlet was probably built around this natural spring, in Celtic and then Roman times, when you remember that the water in the valley was thermal or salty. From the source, turn left, and the road follows the contours of the hillside until you come to the ruins of the château at the far end. Along the way you'll see a plnth on the left; but what has happened to the cross? Here's Kris Darquis beside it. Then a bit further along is the remains of the Roman road going down to the baths in the valley. 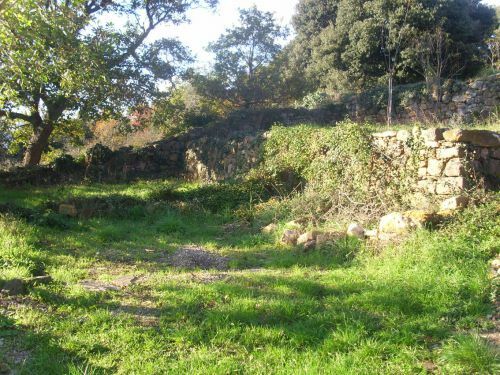 The second photo is the last house of the village; after that is the ruins of the château. There is even a path marked there, where was the Roman road down into the valley. This importance of Montferrand was confirmed by a look at place names; right up to the Revolution (1789) the place was known as Montferrand-les-Bains. Unlike today, when Montferrand is a satellite of Rennes-les-Bains, in pre-Revolutionary days, Rennes-les-Bains was a satellite of Montferrand! There is evidence the chateau was in use by the aristocratic Fleury family towards the end of the 1790's; some of the family left during the Revolution, and as happened in many places at the time, the chateau was abandoned or else stripped of possessions by the country people. 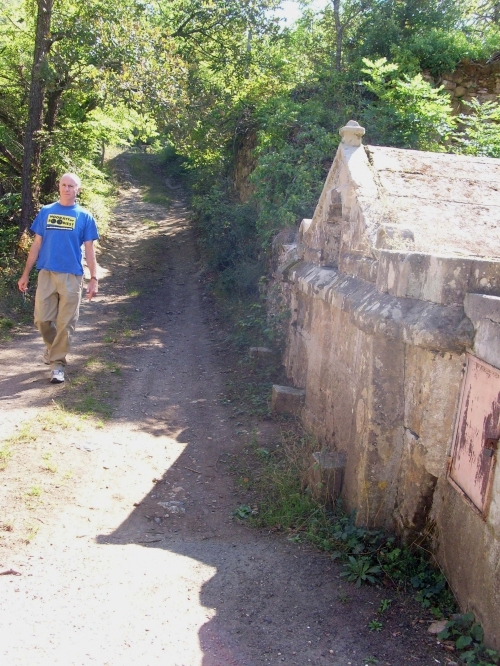 Now the ruins are walls only a metre high, and most of the hamlet of Montferrand is owned by a lawyer from Paris. It is becoming more popular now and many houses are being renovated. 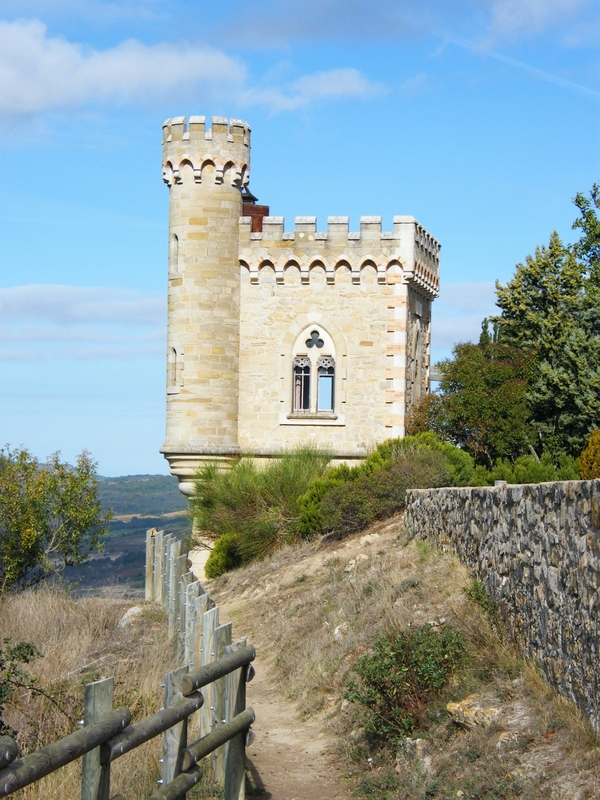 It is my belief the chateau started life as a Roman watch-tower, when you think a watch-tower was necessary to watch over the valley and especially the gold-mine on the hill opposite, at Roc Négré. No trace of this legendary mine has ever been found; but across the northern valley from Montferrand, just north the chateau, is a ruined mine. It's marked on the IGN map. A local man told me this was the legendary gold-mine. But I didn't believe him, or rather, I suppose the gold-mine was certainly legendary! The name of the hamlet, Montferrand tells us clearly that Montferrand was, or guarded, an iron mine. The name means "Mountain of Iron." The chateau, on the very highest part of Montferrand, was the site of a Roman watch-tower to guard this iron mine. 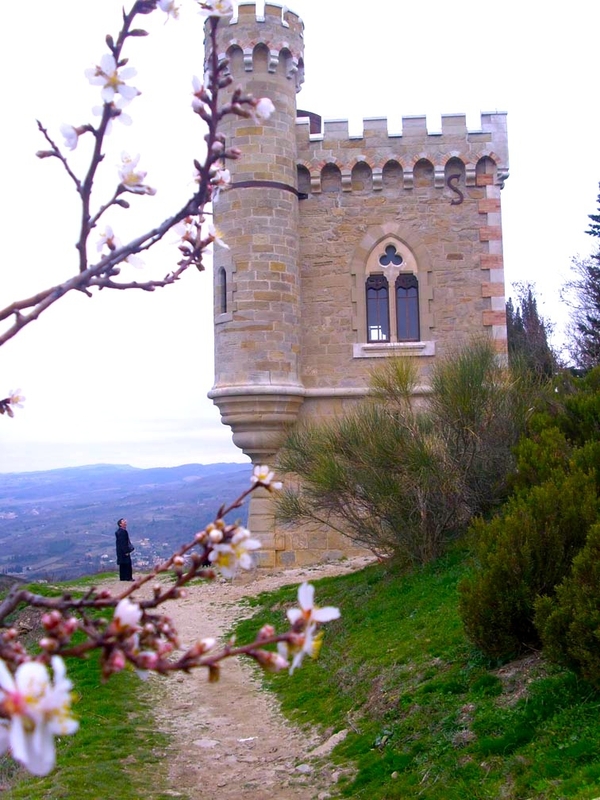 This watch-tower would have been renovated by the Visigoths in the 6th century, who were very concerned to protect themselves from invasions from the north; from the Franks, the ever resented "men from the north" who later took Languedoc from the Cathars. I confirmed this research during a visit in early November 2011, and my friends too, agreed with my findings. And we all found Montferrand quite magic and wonderful. There is much more about it in my Rennes-les-Bains book with its "Secrets of Montferrand" chapter. Another chapter in the book will tell you where you can really find gold. Talking about the Romans . . . Those interested in the history of the town can see some remains from its illustrious past is the small museum, a part of the Salle de Patrimoine, opposite Hôtel de France. There is much documentary evidence describing valuable finds, especially gold and silver coins, but these have all disappeared, presumably sold to dealers when times were hard. But the museum does include several major finds and much evidence of the Roman life here, 43BC to 420AD. 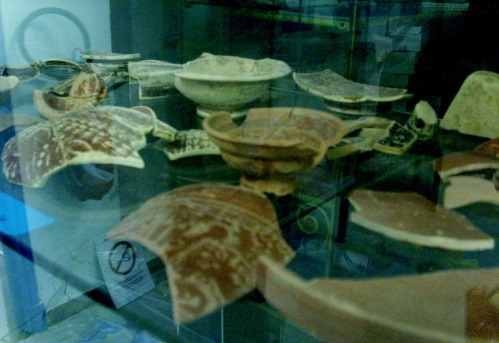 Amphores, rooftiles and sigillée pottery are found everywhere that the Romans lived in our region. 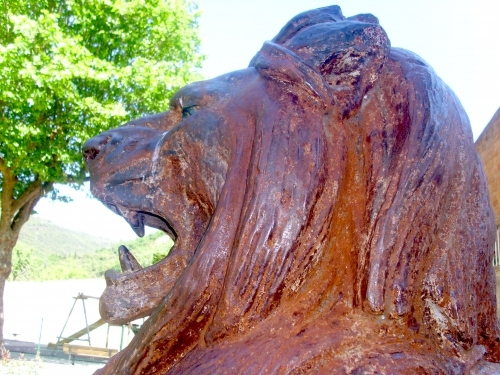 They came to Rennes-les-Bains on an exploratory expedition, around 50BC. 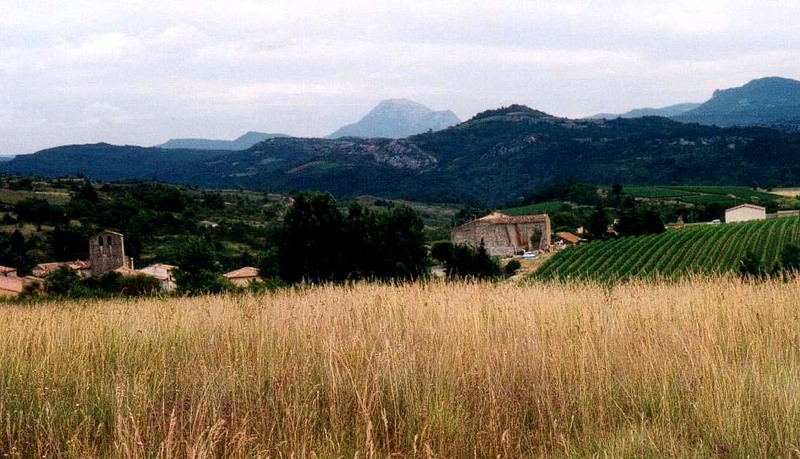 They were investigating the Corbières for wealth to exploit, especially metal mines, which they found in abundance. 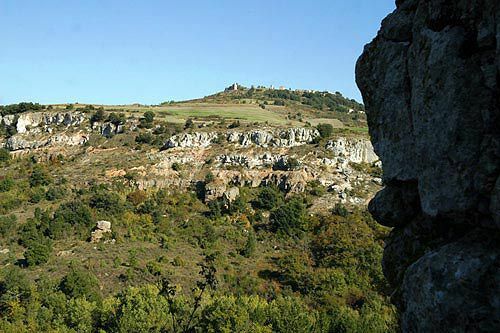 (There is a legendary gold mine at Rennes-les-Bains, but so far no-one has found it.) They established iron and lead mines, and mined deposits of jet and amber. They found the salty source of the River Sals - so valuable to them because the only preservative for food at the time was salt. It was much easier to evaporate the salt from the river water than to mine it, as the Celts and the Romans did in northern France. 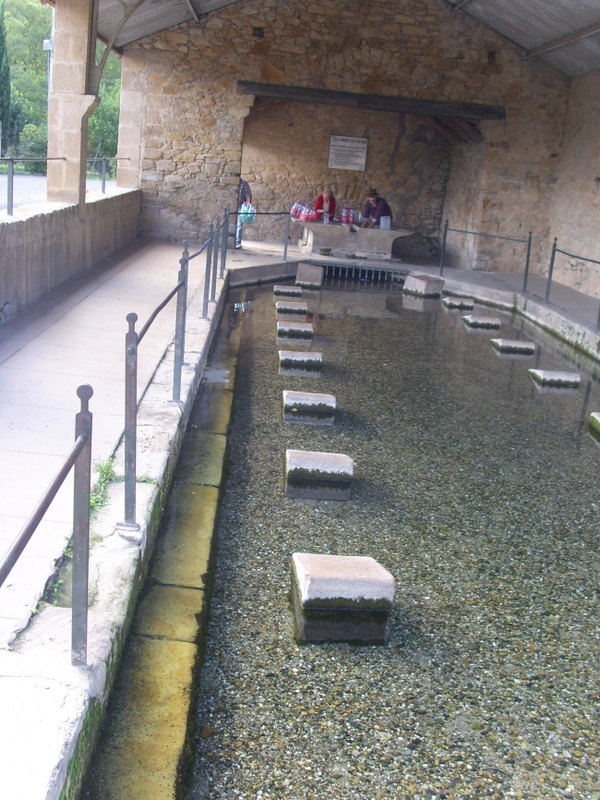 Soon the warm waters were found and three sources were combined to make a magnificent suite of cool, tepid and warm Roman baths, where is now the Bains de la Reine. The establishment was very like the sports centres of today, for it included a sauna and a restaurant. In the floods of 1992 part of the modern structure was swept away and the fantastic high-quality mosiacs were revealed; to be covered over by today's new bath on stilts after the archeologists had done their research. 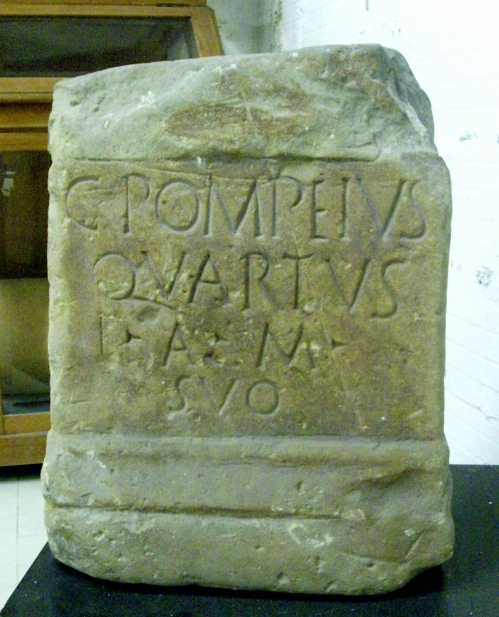 In the museum is a Roman altar stone. These small altars were made everywhere, often in people's houses, basically plinths to support a statuette or a bowl to collect the blood of sacrifices. Some had just a flat surface where offerings could be left, flowers or fruit, or a candle or lamp lit. The message is put in place by the person who erected the altar. Another item of interest is the head discovered by Henri Boudet, the priest who wrote a book in 1886, which makes it obvious he thought the head was of Our Saviour, Jesus, and hence Jesus had lived at Rennes-les-Bains. 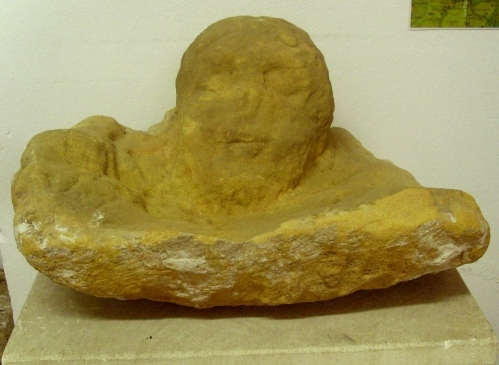 The priest had hacked this head from a menhir near the land now called L'Homme Mort, and it was cemented into the wall of the presbytère for many years. But it was not the head of Jesus, the archeologists say it was the head of a Celtic Goddess and have called her The Goddess of the Waters. 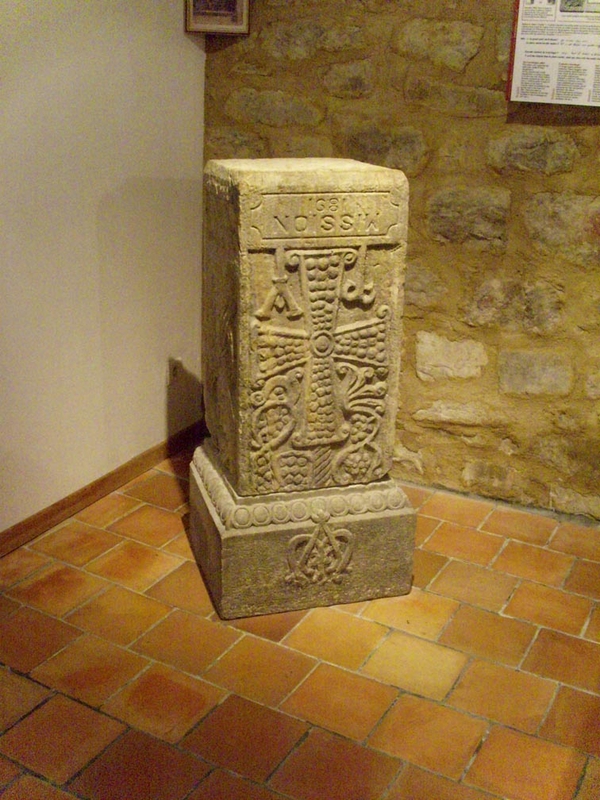 After the Romans came the Visigoths; they left a decorated gourd with an apparent crucifix on it, but I am dubious, I think it was just a equal-armed cross as their Cross of Silence, which appears on the Visigothic altar pillar which was found at Rennes-le-Château. 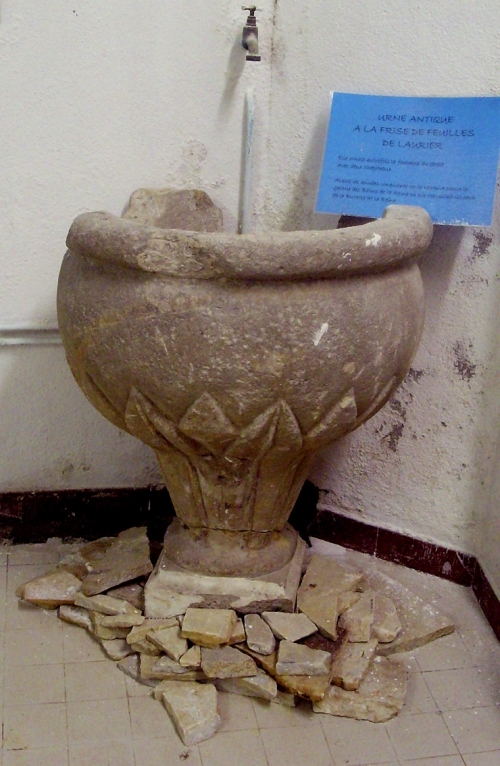 They also left a vase, which was used for a long time to decorate the Source du Cercle, but it is now on show in the museum. As you walk up the old stone pathway towards the Mary Magdalene Church, in the mysterious little town of Rennes-le-Chateau, in the heart of Languedoc, France, there is a curious latin inscription above the doorway etched in stone which loosely translates to "This place is Terrible." Terrible you say? Oh my, what an interesting message our dear old friend L'Abbe Berenger Sauniere passes onto us from beyond the grave! Though, if you keep an open mind, then perhaps it's not that ominous at all. The dictionary will tell us that it actually means "remarkable, formidable, familiar, great, fantastic or "pas terrible" meaning "nothing special." So, he gives us something to ponder as we step through the passageway into this magical little chapel! Perhaps its best to not take things too literally when dealing with this mystery, as one will discover, very little is as it seems. Perhaps the not so obvious message one might miss, at first glance is that this place is truly unique and a treasure to be cherished. And "terrible" would not be my first choice to describe it, enchanting more comes to mind. It was he, the now infamous priest over a century ago who renovated this lovely little chapel and in the process was rumoured to have found a vast treasure and subsequently became a multi-millionaire over night! Though to this day, no one has yet to reveal exactly what exactly he found but the speculations and rumours are endless! Some say it was the Knights Templar Treasure or the Visigoth Treasure, others say the Cathar Treasure or several other elusive treasures Others still, say it wasn't a monetary treasure at all but truth or knowledge, forbidden knowledge which someone paid handsomely to conceal perhaps. Yet, it was the treasure trove of bizarre clues and encrypted messages in his not so traditional Catholic decor choices which have baffled scholars, researchers, historians, treasure hunters and mystery enthusiasts alike ever since. Ladies And Gentlemen, Meet The Devil! Though, without question, one of the more curious clues of all, eerily greets you at the door! As you step through the old wooden doorway, the first image which jumps out at you, quite literally, to your left, is something rather unique in a church and seemingly, quite frightful. There, crouching ominously, is a life size statue with the most ghastly expression upon his hideous face of, what some say is, the devil himself! Yet, that is just one of the endless arguments between researchers, treasure hunters, enthusiasts and anyone else who has a strong opinion on the subject because no one knows exactly who he is meant to represent and why he is crouched down staring gruesomely at the checkerboard floor with his eyeballs bugging out of his head and his mouth gaping wide open, as if he wants to share some deep dark nefarious secret with you. But what exactly is this demonic secret and do we even really want to hear it? What was Sauniere trying to tell us? What encrypted message did he leave us here? The possibilities are in abundance. Perhaps was he warning us of something foreboding and "terrible" as the inscription may read? Or, as the dictionary will tell us, maybe he was just telling us that this place is fantastic and formidable and not such a terrible place at all, nor is the little creepy demon at the door? Though taking into consideration that this town and the church itself have been the subject of an endless string of unexplained and bizarre mysteries ever since, one must take pause and ponder. 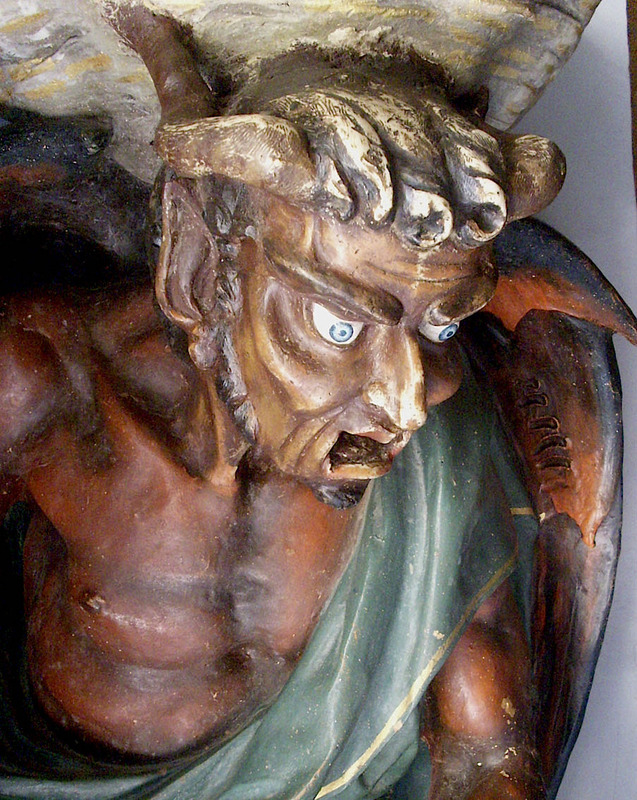 Why, in Gods' name, would a priest put a statue of the devil at the entrance of a Catholic church unless it was a secret encoded message for those who came after him as a menacing clue to a dark mystery, only for those with eyes of which to see? Or for the more level-headed ones, perhaps there is a much more logical and less nefarious explanation which weaves it's way into a much more intriguing meaning, upon closer examination. In all honesty, it is a tad difficult to know beyond a shadow of a doubt without asking him directly and we all know that no one can speak to the dead, right? And thus we are left to our own devices, to study the clues, pour over the evidence and draw upon our own conclusions. Interestingly, there is a half clam shaped bowl or baptismal font, resting cumbersomely atop his crimson, red horned demonic head like a bold fashion statement. Which of course is meant to hold Holy water though more often than not, it's as dry as a bone. That in itself is a tad worrisome! Does it perhaps boil and evaporate upon contact? Recently I actually witnessed it filled to the brim and there was not a boiling bubble to be found! I even touched it, just to make sure! And another interesting "coincidence" we can also see in one of the statues, Jesus is kneeling in the exact same position as our little devil while being baptized by John the Baptiste. Baptism, holy water on top of the head? I would like to chalk it all up to a long string of mere coincidences but …really? What was that connection supposed to represent? If you have studied this mystery even remotely, you will discover that nothing is random, right down to the tiniest details, especially the "Devil's Details." Everything has numerous possible meanings from the logical and obvious, to the totally obscure, far-fetched and bizarre. Thus, one must surmise that these clues are only left behind for certain people, perhaps "Initiates" with the gift or preparation to understand. And for the poor unfortunate rest, they remain in the dark, theorizing and hypothesizing, until the cows come home! Many refer to him as the powerful demon "Asmodeus," said to be the King of Demons back in the day. The first to make mention of this in print being Gerard de Sede, author of the well known book entitled "The Accursed Treasure" or "Le Tresor Maudit" which seemed to fuel the fires back in the late '60's that there was, in fact a vast monetary treasure buried in, or nearby this town. And it is said that Asmodeus was the keeper or guardian of said treasure. So, was Sauniere trying to lead us to fortune and fame or something very different entirely? Perhaps we should heed caution in taking things too literally and search for deeper, more symbolic explanations. Though, the title did say "accursed treasure!" Perhaps he was trying to warn us to stay away! Perhaps not all that glitters is in fact gold, as the old saying goes. Perhaps, he was warning us that we should not be tempted by the sins of lustful greed and stay true to our spiritual path. But you know humans, if someone whispers or even mumbles under their breath the words gold and treasure, they swarm like maniacal moths to that all too tempting yet deadly golden flame! Asmodeus was also said to have assisted in building the Temple Of Solomon in Jerusalem by way of dark demonic sorcery. And this brings up another interesting rumour, that there is another Temple Of Solomon hidden deep underground, beneath Rennes-le-Chateau or nearby. A Temple Of Solomon in France? How bizarre! It is a well known fact that the area has a vast deep underground tunnel system which the Romans used in their mining of Iron and salt. Yet these subterranean tunnels are also steeped in many mysterious stories and legends of danger, unexplained deaths and of course more hidden treasures! We can't forget to mention that the Visigoths stacked Rome, made off with a vast treasure and promptly zipped up to, you guessed it, Rennes-le-Chateau immediately afterwards. There's proof that the Knight's Templar made their way there after finding the mysterious treasure under the Temple Of Solomon in Jerusalem. 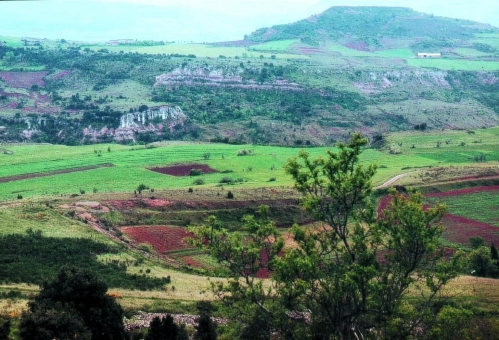 Blanche de Castilles was said to have hidden her treasure in the area also. There was the elusive Cathar Treasure everyone keeps talking about which mysteriously vanished during the gruesome Albigensian Crusade. The Merovingian Kings were in the area and rumours circulated of a treasure as well. Marquise Marie de Negre D'ables, D'Hautpoul who actually lived in the famous Chateau Hautpoul in the town had her secrets and treasures buried there, perhaps in the crypt below the church and that's just naming a few! Also, above the statue are the two letters "BS" and I know what you're thinking but I don't think the first word was bull, Sauniere wasn't that comical! Some assume this was simply his initials Berenger Sauniere but that would be far too easy! Others say the B stands for Boudet, the name of Sauniere's good friend and fellow priest who was Sauniere's right hand man during the treasure hunting days and S for Sauniere. Still, far too obvious, I probed deeper, much deeper and pondered and something hit me right smack in between the third eye! Sauniere was French, so I thought for a moment like a Frenchman, a very secretive Frenchman. King Solomon was said to have possessed a very powerful seal ring which he claimed was given to him from the heavens and it was engraved with the words "most great name of God," or true name of God. It was said to have been made of brass and iron. Upon the brass part he wrote his commands for the good genii and on the iron part his commands for the bad genii or demons, which is how he apparently controlled them and got them to do his heavy lifting so to speak. It is also said that he received 4 jewels from 4 different angels which he set in the ring which gave him the ability to control the 4 elements. Wait, did I just say 4 angels? We'll get back to that in a minute. The legend goes that Asmodeus seized the magic ring and tossed it into the sea, thus relinquishing King Solomon's power. But no worries, as luck would have it, King Sol went fishing and caught a random fish which just so happened to have his magic ring in the contents of its stomach, no sorcery there, I'm sure it was a total fluke! That is reminiscent of another story of a certain masculine part of Osiris being cast into the river and being eaten by a fish. Its all very fishy indeed! So what does King Solomon's ring have to with the initials BS you ask? Well, in French, Solomon's Ring translates to Bague de Solomon, "BS"! Voila! Case closed, mystery solved, right? If only it were that easy! No matter how hard you try, the mystery never seems solved! But we may be onto something here. 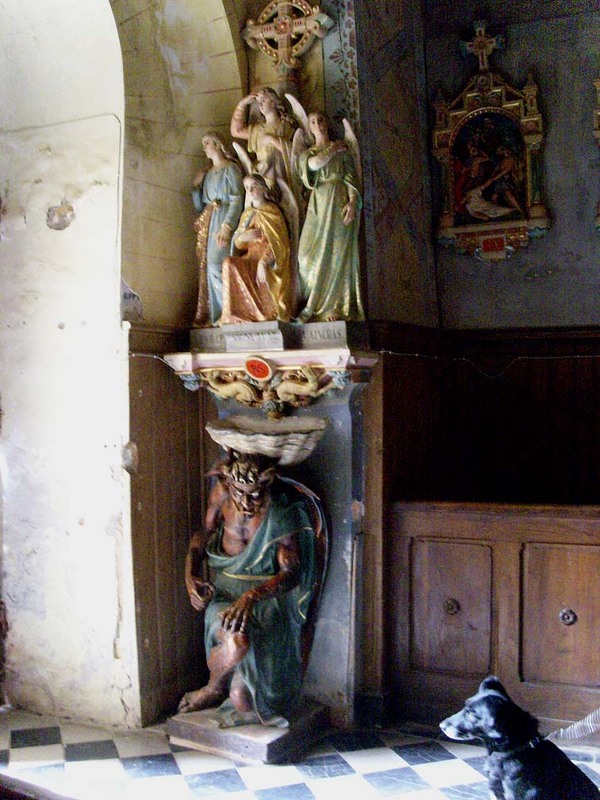 Back in the church, above Asmodeus stands the statues of, you guessed it 4 angels, again relating to the legend of King Solomon's ring and the 4 magical stones. Each of them doing one sign of the cross and below them is the statement "Par Ce Signe Tu Le Vaincras" meaning "With This Sign You Will Conquer Him. Did he mean the ever popular and Catholic church approved sign of the cross the angels were making would conquer said demon or the sign of the pentagram or Five pointed star of Solomon's seal Ring, BS? Seeing as though that is said to be the magical ring which controls and exorcises demons? 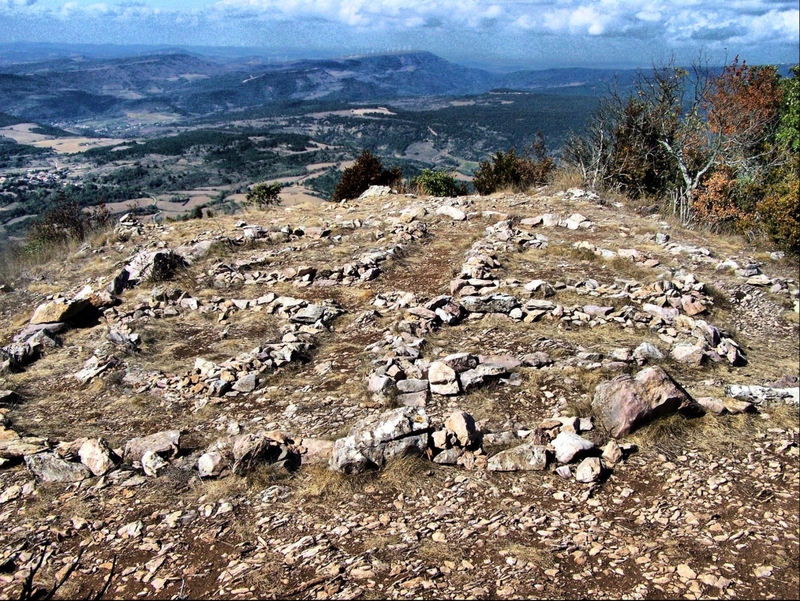 And considering how often you see pentagrams in the area, like the church in the mysterious nearby town of Alet-les-Bains or in the amazing sacred geometry of the landscape which our dear friend Henry Lincoln has discovered, they seem to be cropping up everywhere! Another mere "coincidence?" So, was Sauniere trying to tell us in a rather roundabout and encrypted way that there is a strong connection linking this church and the legend of the underground Temple of Solomon? "As above, so below" they keep saying, thus, is this temple below? Below the church? Below the landscape? Was King Solomon's magical missing ring what perhaps Sauniere stumbled upon in his quest for treasure which coincidentally claims to have control over demons? Did he perhaps discover this and bind the very powerful little demon Asmodeus beneath the church along with the accursed treasure and that's why the crypt has been inexplicably sealed, doors even walled up with stone, ever since? Or perhaps that's a little far-fetched. Are we digging too deep? There is another play on words I quite like when I put my French beret on, there are endless legends and rumours about certain mountains in the area being sacred and containing hidden treasures such as the stunning nearby mountain of Cardou which some say is the final resting place of Jesus Christ himself but that legend opens up a rather awkward can of worms with the Catholic church for obvious reasons! So for now we shall let sleeping demons lie. Then there is the cave which was said to be the final resting place of Mary Magdalene not far from the town also. In fact, if you stand atop La Tour Magdala which Sauniere also had built, seemingly to honour Her you can see the cave! Then, there is the mountain of Bugarach which ominously looms in the distance and is said to have contained or may still contain possibly "The Ark Of the Covenant of all things! An amateur researcher in the late '80's by the name of Daniel Bettex was rumoured to have actually found this holy relic. Yet, oddly, but not surprisingly, he too died a strange and mysterious death, some say within the caves of this foreboding and strange mountain, taking his secrets with him. Also, there is a legend that the sacred mountain of Montsegur, a mere 22.2 miles away and the majestic chateau ruins atop her peak is or was rumoured to be one of the locations of a mysterious treasure. This was the last strong hold of the ill-fated Cathars back in 1244 who were barbarically slaughtered or burnt at he stake by the Catholic church. And some say it was because they were the guardians of the Holy Grail itself! Though, none of these rumours have ever been confirmed nor denied, publicly anyway! Now, if you look at the word "demon", then you translate it to French, Daemon, it sounds eerily similar to "Des Monts" which translates to "the mountains." There is a rather long and complicated theory I briefly touched upon, involving sacred geometry within the local landscape spear-headed by the very well known author and respected researcher Henry Lincoln which depicts pentagrams literally everywhere within the landscape. And if you put all that together along with the theory of the checkerboard floor in the entrance of the church being somehow a map of the landscape which Boudet explains in his book "La Vrai Langue Celtique or "The True Celtique Language," we now have the "Daemon" in the church staring at a certain spot upon the checkerboard floor, along with a statue of Jesus in the church also staring at the same spot. Thus, one might let their imagination run wild with wonder that maybe, just maybe, our dear friend Sauniere was perhaps trying to tell us of a secret treasure hiding in "Des Monts" or the mountains nearby. 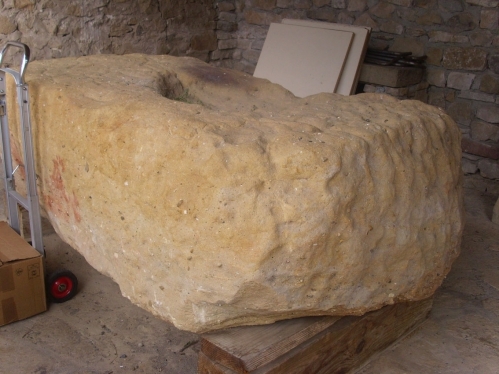 That, coupled with the fact that there is a stone in the shape of an armchair affectionately named "The Devil's Armchair" just in the nearby village of Rennes-le-Bains. In Boudet's book he actually has the face of the devil within the landscape on his detailed map of the region, marking out a certain spot of interest, perhaps pin-pointing a very key location. 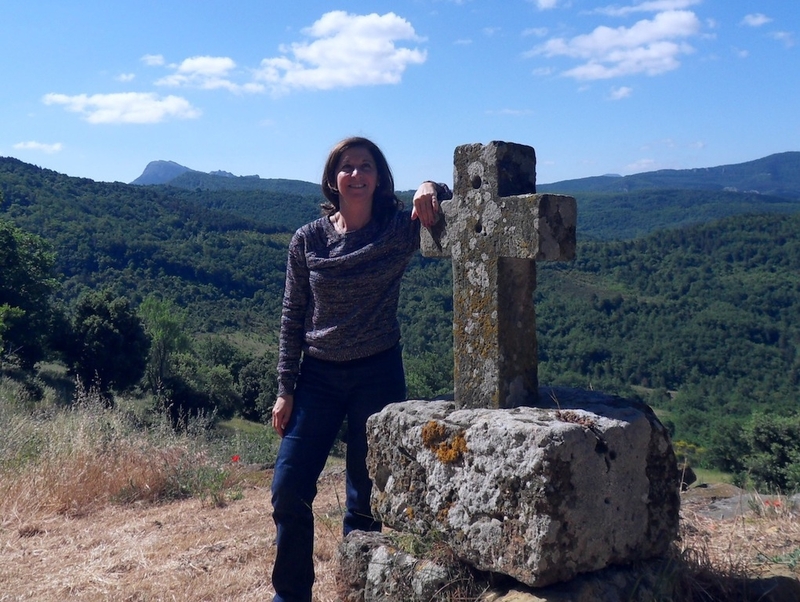 And lest we forget, not far from Montsegur there is a very remote lake named, you guessed it, Devil's Lake, high atop a mountain where some say the Cathars tossed their treasure into to protect it from the nasty crusaders and the church. And now you have yourself some rather compelling reasons to run out and buy a metal detector and head for the hills, shovel in hand, as many a treasure hunter has done, seemingly in vain for over a century! Asmodeus was also said to be the demon of Lust, one of the seven deadly sins of course. Some say he is responsible for twisting and contorting human's sexual desires and if you fall for his naughty trickery, you may find yourself headed straight for hell in a hand basket! There are many conflicting stories as to who this little demon was and what kind of mischief he got into. It is said that he fell in love, so to speak, with Sarah and each time a man tried to marry her, he killed him right before the wedding, out of blind jealousy, so that's proof alone that he was a die hard hopeless romantic, in demonic terms anyway! Another legend from the Talmud says he married the infamous "Lillith" and she became his queen. And an even more bizarre and conflicting story is that he was said to be the love child of Adam and the angel of prostitution "Naamah," conceived while Adam was married to "Lillith," but then, that once again opens up another awkward can of Catholic worms doesn't it? Adam and Eve being the first two people on the planet, according to the bible, where in tarnation did Lillith drop in from? And then there was Elizabeth Van Buren's ground breaking research which stated that the true "Garden Of Eden" was in fact in the Rennes-le-Chateau area. Are we seeing a pattern yet? But sadly, she was written off as a mad woman and not taken seriously. But if you read her compelling book "Refuge Of The Apocalypse - Doorway To Other Dimensions," you may very well get an interesting perspective on this theory and so much more! Though, in truth, Sauniere never really confirmed to us that the devil by the door was in fact Asmodeus at all. Was he trying to tell us to beware of the dangers of lustful desires? Was he trying to warn us in some way that this place was filled with danger or is, in fact a "terrible place"? Was it just another tool for the Catholic church to scare us into being good little boys and girls or else? Or, was his message a tad more complicated? I suppose we will never truly know for sure unless of course one day, the long sought after truth is alas revealed. Like that's ever going to happen anytime soon! 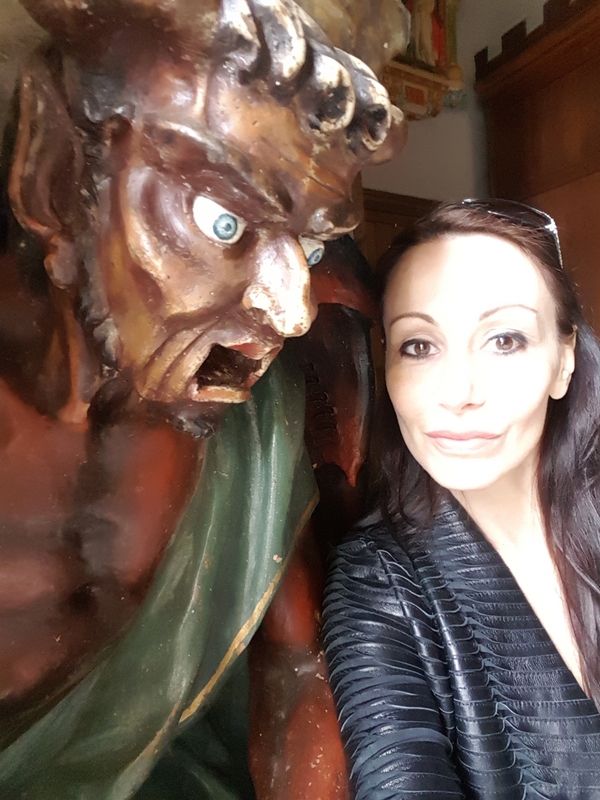 Until then, tourists will continue to pose for selflies with our little devil and continue to ponder and speculate. 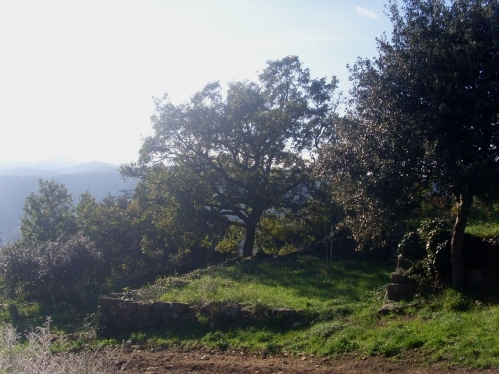 And treasure hunters will continue to search feverishly in vain for that vast pot of gold at the end of the rainbow, apparently still lurking far beneath the Occitan soil, which may or may not even exist. One must remember that the most valuable treasure of all is knowledge and that comes in many shapes and forms though is rarely in the shape of a golden cup! But I will add one little tidbit from personal experience. My first time entering this enchanting chapel, I was filming the long anticipated moment with my video camera and as I knelt down in front of him to get a better view of his ghastly face, something strange happened which I only discovered later. Upon viewing the footage, I noticed that the audio on my camera went completely haywire with a loud high pitched ringing and an over abundant amount of strange sound distortion, which seemed to get louder when I got closer and touched him.... almost as if he was reacting to my touch. And come to think of it, the noise did sound an awful lot like a metal detector going off but I'm sure that too was merely a "coincidence!" 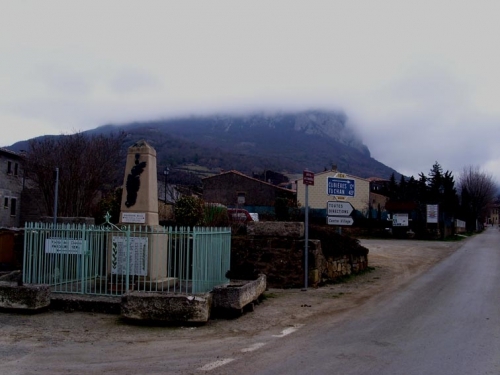 The legends of Bugarach play such an important role in the mysteries of the Two Rennes . . .there are deep connections between Rennes-le-Château, Rennes-les-Bains and Bugarach. Bugarach village seen from it's mountain. You can find Bugarach on the D14 road some 10km south of Rennes-les-Bains, itself about 6km to the east of Couiza, south of Carcassonne. The commune includes both the village and the mountain, Pech de Bugarach. The mountain, 1230m high, is known as "The Crossroads of the Four Winds" and also as the Mountain-with-its-feet-in-the-air, because it once blew up and the top part of it landed upside-down-down. There does seem to be more of it above than below. 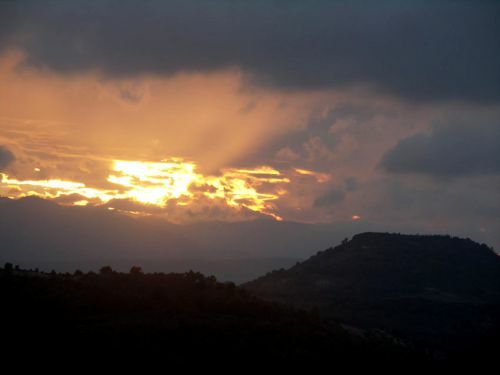 It dominates the south of Aude; you can see it from almost everywhere. It is an orientation point - they used this mountain to orientate Monségur because compasses don't work on the pog of Montségur. The mountain is a dormant volcano; ariel photos clearly show its crater. It is full of limestone caverns and the internal fires still raging deep down give rise to the hot springs that flow down towards Rennes-les-Bains from Sougraine in the form of the River Sals. The water is also slightly radio-active. If you climb up the mountain after sunset, you will hear strange noises and see strange lights (some brave souls have done it) and the legends of strange lights and flying saucers here are tumbling over each other for recognition. Your ears start buzzing - well, so would mine after that climb! 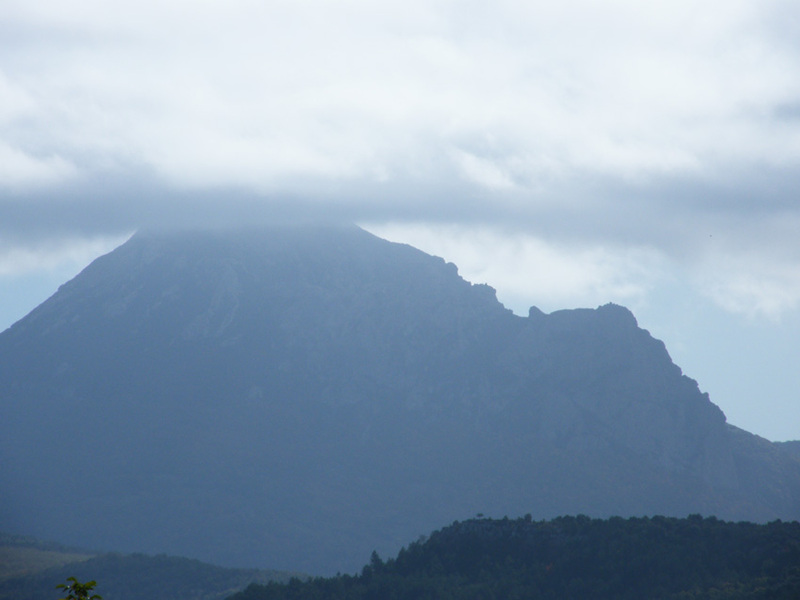 Most of the reports of UFOs are sightings of clouds, and it is rare day when no cloud hovers over Bugarach and its crater. Underneath the mountain, legend says, is a huge lake, on which space-ships can sail, until such time as they need to return to their native planets. This is strange, because other legends say that underneath Bugarach is the grand forgotten continent of Lemuria. This is all nonsense, for the Lost Continent of Lemuria, which existed a mere 44,000 years ago, was a fictitious Victorian imaginary place, popular with the psychics and seers of Victorian London. Bugarach is also apparently an outpost of Atlantis, the legendary utopian civilisation where all was sweetness and light, that existed somewhere near Iceland about 12,000 years ago, and then disappeared but meanwhile gave its name to the Atlantic Ocean. There are some rocks between Bugarach and Mont Cardou, just to the north of Rennes-les-Bains, called The Gates of Atlantis. Some of these legends are patently ridiculous, but people cling to them as though they are pets. Bugarach and it's clouds - as seen from Rennes-le-Château. And when I went to visit the village it was totally obscured! Let's get back to real history. In the year 889 the village was called Villa Bugario, implying it belonged to a Roman called Bugarius. 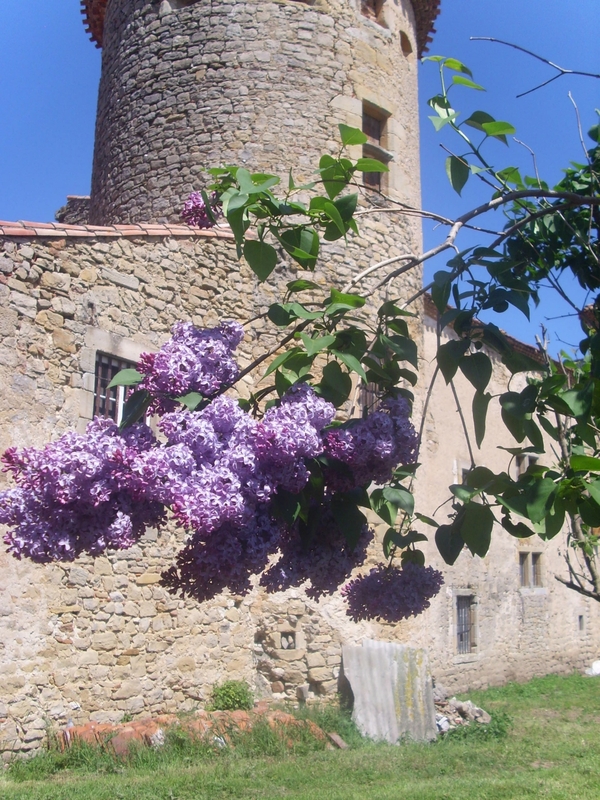 Many villages in Languedoc whose name ends in -ac were of Roman origin, and by 1194 the village was called Ste Marie de Bigarach and it was known as Bugarach by 1781. I think we can assume that the settlement of Bugarach started its life in Roman times, around 70BC, if not a little before. The story that Bugarach was named after the children of Jupiter, Bug and Arach, is a children's story tale. 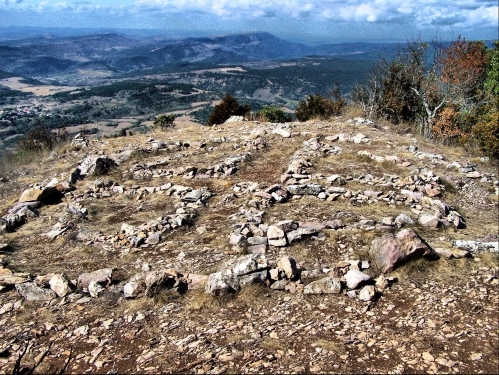 After the Crusade against the Cathars, who supposedly had a faith descended from that of the Bogomils (but it has been proved they didn't) the legend arose the mountain was named after the Bulgares, Bogomils or even Buggers!!! 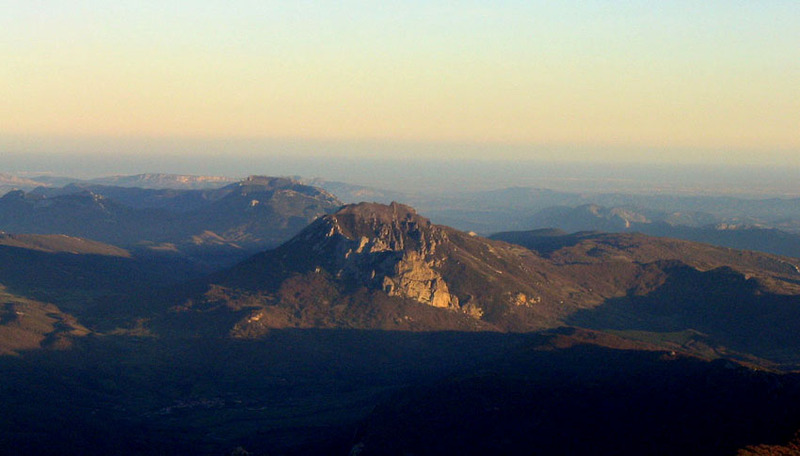 The Victorian writer from Carcassonne, Louis Fédie, says Bugarach was originally a Celtic oppidum, which became Gallo-Roman. This implies it was a position that guarded the old road, which would have been Celtic before it was Roman - it was certainly a Celtic packhorse route before it reached Rennes-les-Bains. 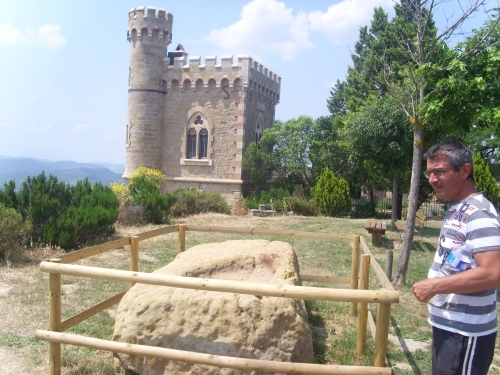 Fédie says the church was built in Visigothic times, that is sometime before 769AD. It was originally consecrated to St. Anthony the Hermit, a third century saint. Still today, every Ash Wednesday, there is a procession through Bugarach village, featuring a hermit who carries a cross. On the cross is a horse's collar with bells on it - and also strings of pork sausages! This is because St. Anthony the Hermit is the patron saint of pork butchers. The pig, usually a jolly fellow featured in pictures of him, is supposed to represent the dreadful temptations Anthony suffered in the desert - the Devil was particular keen to tempt him into "fornication." The saint resisted magnificently and didn't die until he was 84. 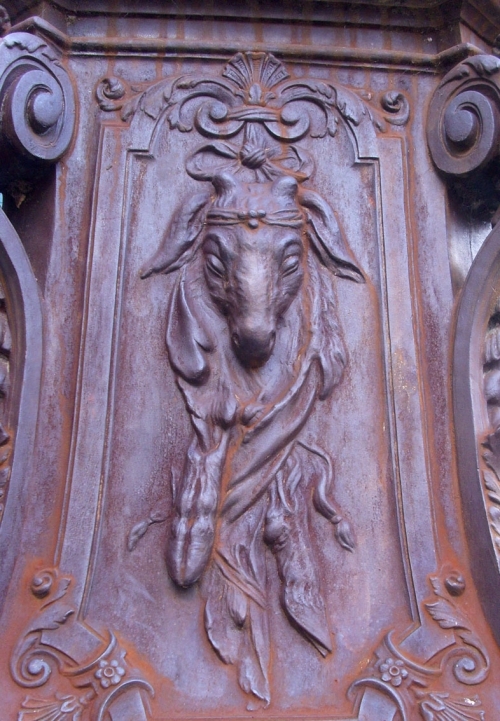 The church at Bugarach has lots of "pagan" symbolism in it. One enters the church to see the altar at the far end - and on either side of the altar is a plaque of a grail cup. 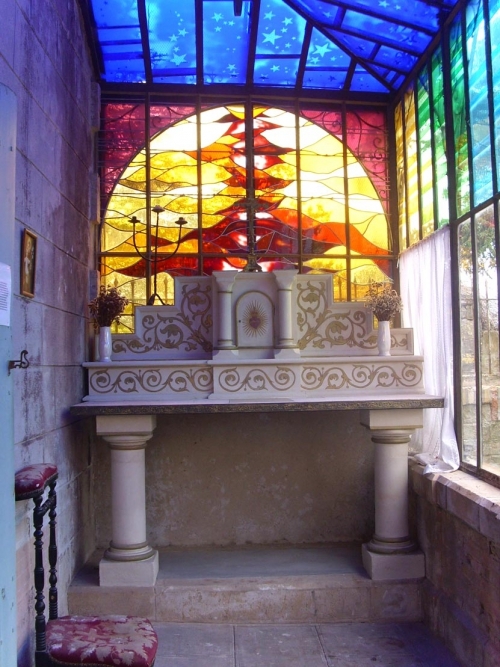 In the church has a mysterious stained-glass window. It shows a boat with a sail, and on the mast of the boat is a wheel, bearing a marked resemblance to the Wheel of Fortune of the Tarot cards. The sun is setting to the right; and high in the sky on the left is a crescent moon. 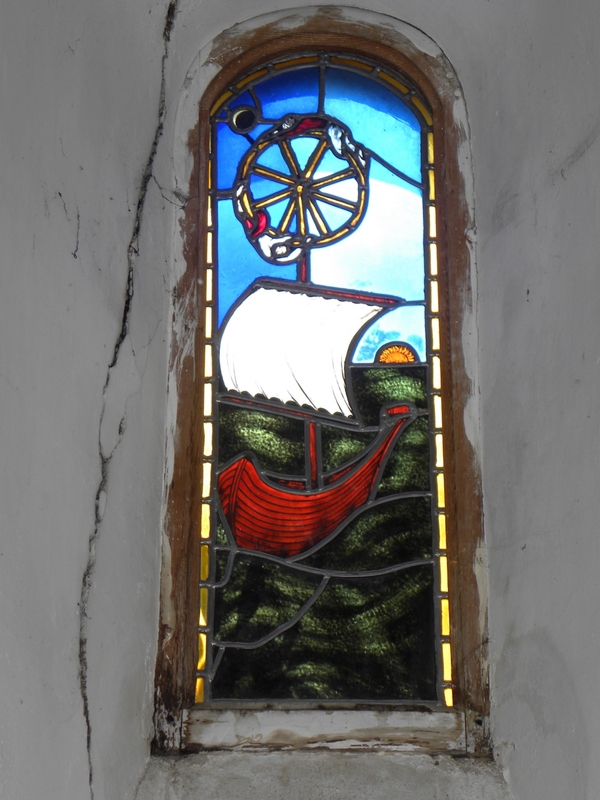 This window is really in remembrance of Jules Verne, who often holidayed in the village. Bugarach inspired many of his novels, especially "A Journey to the Centre of the World." He also wrote a mystic book called Clovis Dardentor, published in 1896. The story is about a sailing boat - and the Captain was called Captain Bugarach and described as "he who is the master of the quartering wind." 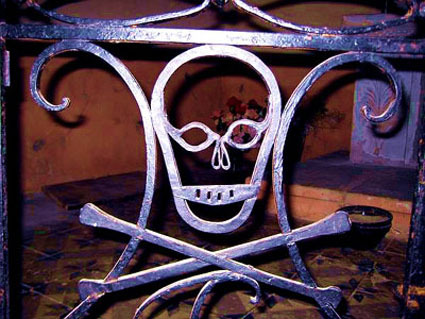 On a side entrance from the church is a skull and crossbones - surprisingly often found in Christain churches of the Ariège/Aude region. This invites us, as the masons do, to meditate on our immortality. 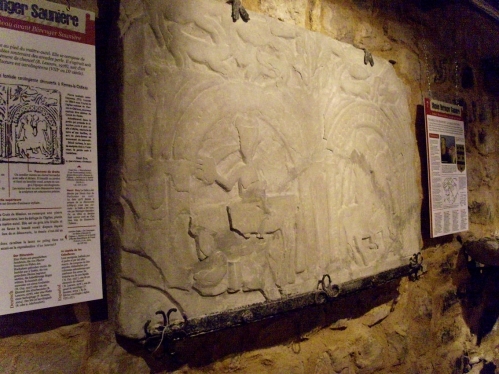 In the church is a plaque to the Book of Seals - a secret book of the Cathars reputed to be solemnly opened only at Bema - Easter Sunday - according to the book "The Secret Message of Jules Verne," by Michel Lamy, which is on sale at Rennes-le-Château. However, I'm not convinced. If the Cathars celebrated Easter it was not as we know it today, for they did not like the Crucifix, believing Jesus was immortal right from the beginning and so they did not celebrate the Resurrection. The book in Bugarach church is probably the Jewish Book of the Seven Seals. Bugarach has a ruined 13th century chateau, with only one tower of four still standing. 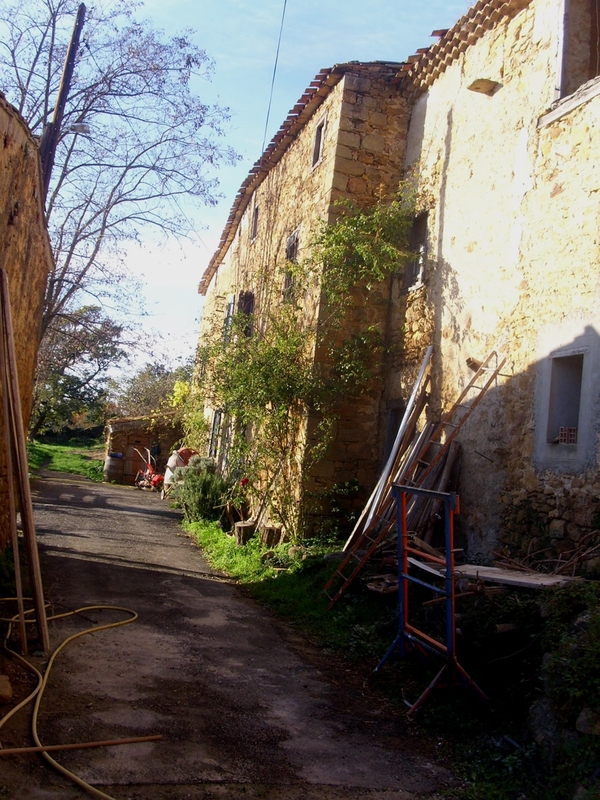 The chateau is currently being renovated. It is privately owned. Properties of the aristocracy were sold off towards the end of the Revolution, but at one time Marie d'Ables from Rennes-le-Château lived or stayed here. For there is a mysterious connection. 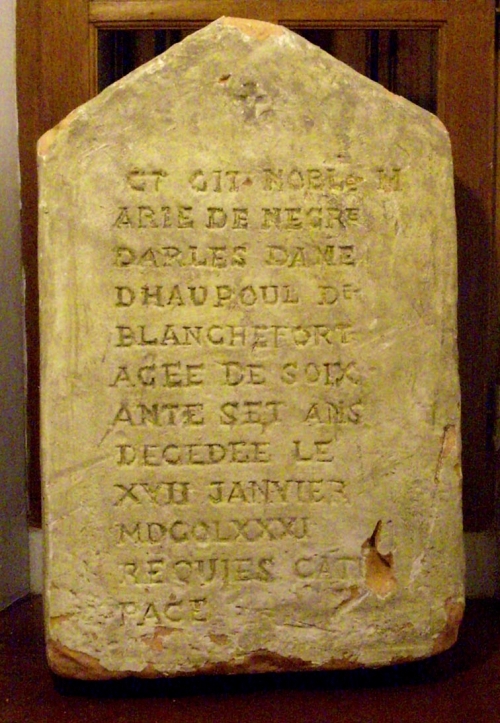 Marie d'Ables de Négre, from Niort, married her cousin François de Hautpoul Blanchefort, from Rennes-le-Château, in 1752 and the wedding took place in Rennes-le-Château, where the couple subsequently lived. This wedding united two parts of the Blanchefort families - and the village of Bugarach was included in the deal. 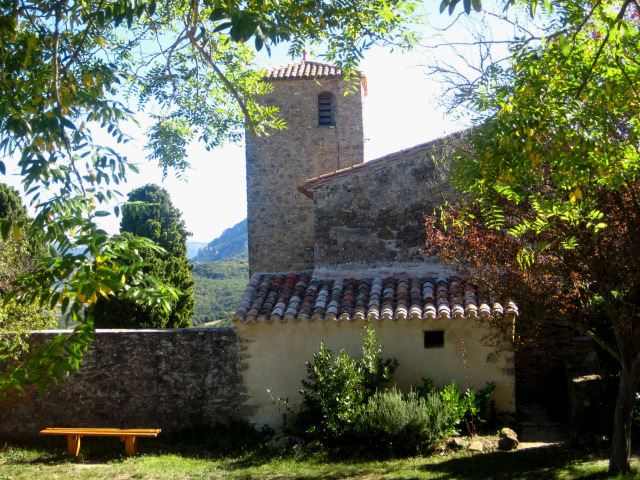 Although the Bishop of Alet-les-Bains officiated, and four lawyers attended and signed the marriage certificate as witnesses, the second and third banns were not called and it all went through in less than a week. Why the hurry? Something was going on. 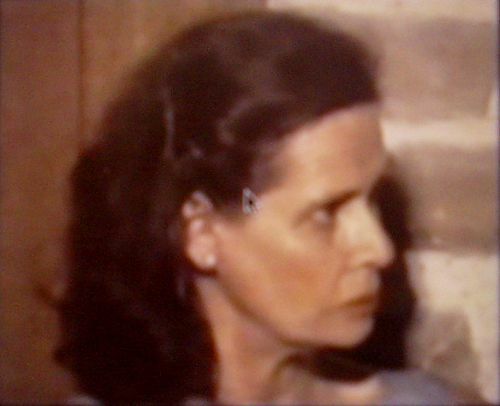 One story is that Marie d'Ables inherited from her mother certain papers about Bugarach that the other side wanted, papers that lawyers later refused to release. 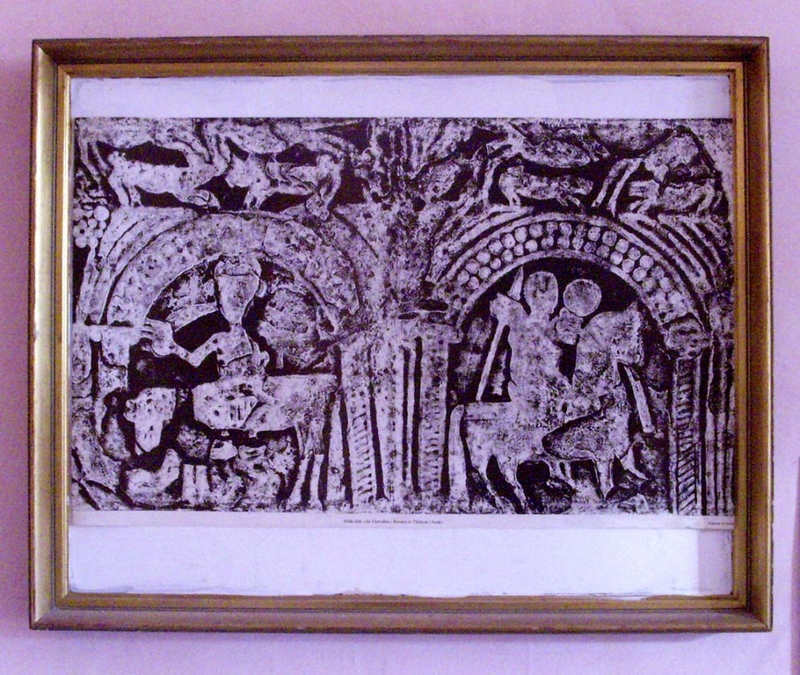 Could Bérenger Saunière have found these papers, or copies of them, when he renovated his crypt? 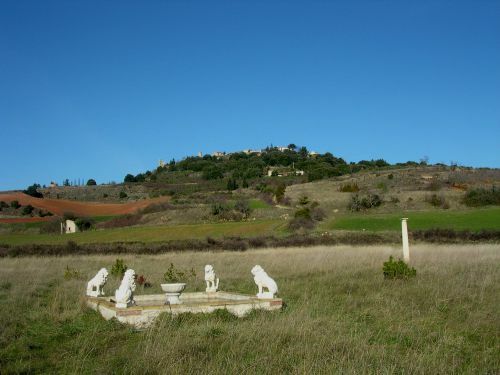 The commune of Bugarach includes the mountain - and the prevailing legend, possibly inspired by those who know about Marie d'Ables, is that Jesus, and possibly Mary Magdalene as well, are buried there. It's thought this was the knowledge that they got married to protect. Marie d'Ables and her husband lived at Rennes-le-Château, she came there from Niort in Ariège, but of course they could have stayed sometimes in the château at Bugarach. Back to modern times! In 2011 the story started that, due to a Mayan prediction, the world would end on the 21st December 2012, and aliens would arrive to take the illuminated ones off the mountain to another planet. How on earth . . . ? 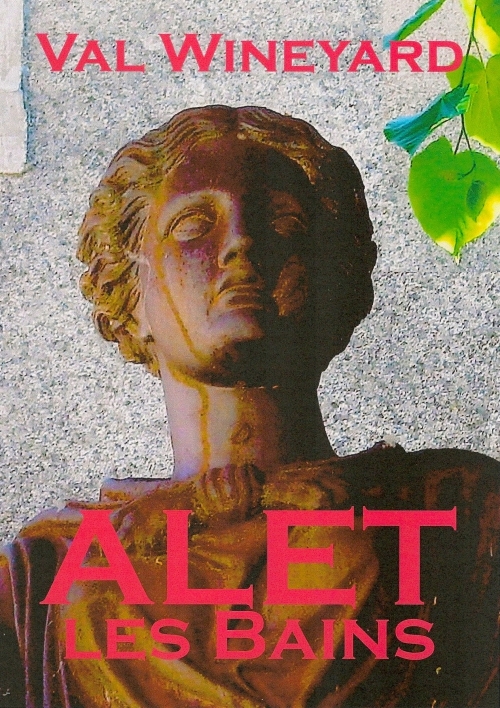 This great lady of Rennes-le-Château died on the 2nd of September 2011. At this particular time of writing, approaching 21st December 2012, hysteria in the region was mounting because the nearby mountain of Bugarach was reputed to be a refuge from the apocalypse; the end of the world was arriving; but believers would be taken away to a new world in flying saucers. This did not happen of course, and many newspapers and magazines posed the question - but how on earth did this idea all begin? Well, it began with Elizabeth van Buren from Rennes-le-Château. She wrote a book called "Refuge from the Apocalypse" in 1986. It's now out of print but with the renewed interest in the end of the world, it's second-hand price has rocketed to £60. In the site's History of Rennes-le-Château he says; A rich American woman, Elizabeth Van Buren, nicknamed "the millionaire lady" in the region, was little known and she was modest about her secret. At the entrance to the village, a sign or placard indicating the Sacred Heart conducts us by an earth road onto the arid plateau. A fountain ornamented with lions is surrounded by a heart formed by 333 roses, not one more or less. There we are - Rennes is quite simply the heart of the planet. The proofs? You'll need a little patience; "This sacred centre will engage itself more and more with positive energy - and from here in one year a supernatural event will take place," she promises. Elizabeth's fountain has now dried up; maybe the water supply was turned off when she moved to Luc. Near to the fountain are some conifer trees that she planted, forming the shape of an arrow and it's said they point to the place where a spaceship will land. You can see the fountain and the arrow of conifers quite clearly from the south-east facing window of the Tour Magdala. You can also see the "Visigothic Tower" which was nothing to do with the Visigoths, but is a restored 17th century mill. The field is very beautiful, between the citadel to the north and Les Labadous to the south-east. Elizabeth wrote several books - the one I have is "The Sign of the Dove", her fourth book. On the back cover it describes the previous books. "Rainbow round the Sun - Earth Changes in the 1980's" has the following blurb; Many prophets in the past have warned of the times to come. Now Elizabeth van Buren has chronicled her own awakening, and the glimpse of the future that has been channeled in her direction. Imminent changes are in store; earthquakes, tidal waves, climatic variations. These natural phenomena reflect the testing time that lies ahead for mankind. "Lord of the Flame" has the following blurb; Why was the Great Pyramid built on the sands of Egypt? Who constructed the secret, underground cities of the Andes? Who really was Lucifer? Why was the worship of the Goddess forbidden all over the world? Was there a polar shift at the time of the Flood? Is it about to occur again? Again - haven't we heard all this again recently? "The Secret of the Illuminati" has the following blurb; This is the story of a secret Plan for the planet, and of those who have dedicated themselves to its fulfilment. Unknown to the vast majority of mankind, a group of initiates in every age has carried forward a Knowledge which is not only sacred but is of a Cosmic nature. Well, for those that don't know, the Illuminati began as part of freemasonry in 1776, but now has a rather sinister reputation as an organisation of conspiracy theorists. Meanwhile, in "The Sign of the Dove" Elizabeth herself wrote; In this work . . . the real meaning of the creation of man is revealed, and who it was who made him. It becomes clear why so many people are having experiences in which they see space ships. We begin to understand why the beings from other star-systems are concerned about the human race. 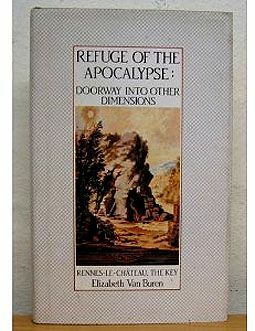 "The Sign of the Dove" was published in 1984 and her next work, "The Refuge of the Apocalypse" in 1986. This was around the time she started talking about the end of the world. 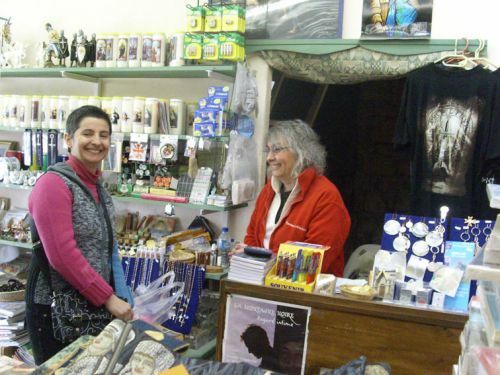 The Bugarach thing is part of a book about Ufos available at Rennes-les-Bains. Its author is Elizabeth Van Buren, the grand daughter of Martin Van Buren, the Eighth president of the United States. 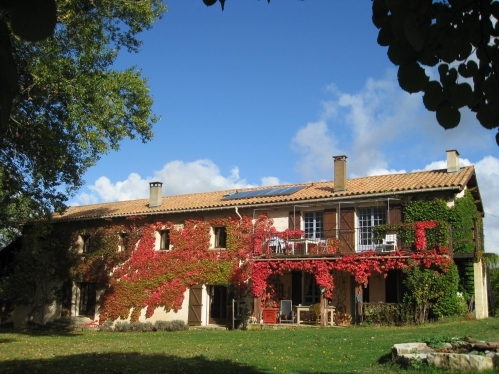 "The Millionaire Lady", as she is called in the countryside, came to live at Rennes-le-Château where, as she was a keen ufologist, she managed her land as a landing pad for UFOs. 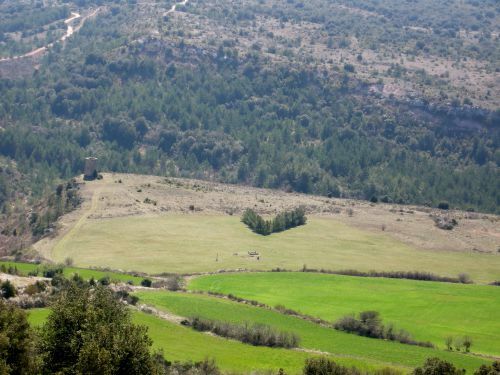 Her book established a connection between the constellations above the High Valley of the Aude and the geography on the ground. She then deduced that, as there was a celestial temple, there was also an underground temple. The myth of Agartha has come back, an underground kingdom blessed with the knowledge to save humanity. One day in the late 1980's, Elizabeth van Buren went up the hill to the citadel of today's village with a group of friends, and they were talking about "some sort of extinction event." They were convinced it would take place and they expected to be collected by some sort of craft that had come from Bugarach for them. They then descended to her land to wait for it, on a wet and stormy night. The apocalypse failed to materialise, so they returned to the village rather downcast the next day. Since then it's been thought that her field with the fountain was the "refuge of the apocalypse." In December 2012 the site of the end of the world seemed somehow to have shifted to Bugarach. There are 26 years between then and now, and some 15km between Elizabeth's field and Bugarach, but the story has remained the same. Bugarach has long been connected with flying sauncers and UFOs and many quite rational people claim to have seen them, although as far as I know, no-one has yet disappeared or claimed to have been abducted by aliens. But even if the lights in the sky really were visitors from another planet, why would their presence be associated with the end of the world? 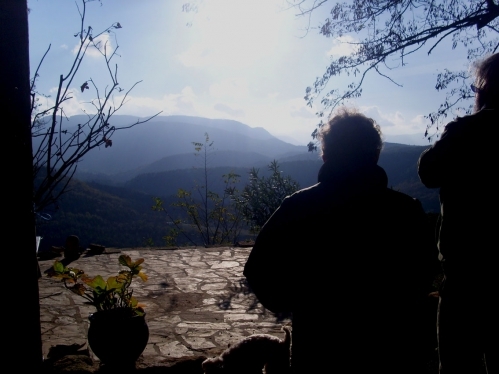 Elizabeth used to run a spiritual centre called the Arcadia Centre at Les Labadous, before she sold it to someone who overran it with dogs, who sold it a year later to Jaap Rameijer and his wife Joke in 1998. A statue to Mary Magdalene that Elizabeth left there is still there. 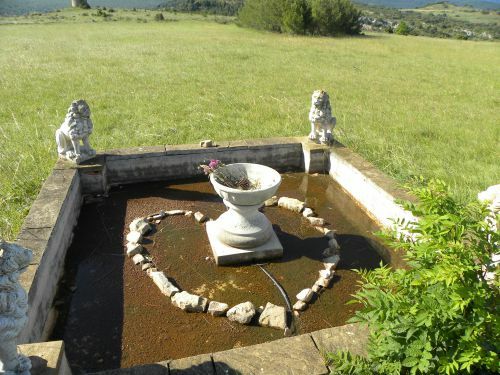 Jaap told me; "On the plateau between our place and Rennes-le-Chateau, there is a special place, a sacred place, a place, so they say, where once a temple of Lemuria stood, a place, so they say, where a UFO is buried, waiting to surface. A place that is a doorway to other dimensions, according to the writer Elizabeth van Buren in her book Refuge of the Apocalypse." Everyone remembers Elizabeth van Buren with affection. Films exist of her on Youtube, so you can see how calm and quiet and "sweet" she was, and always a lady. From "The Secrets of Rennes-le-Château" by Lionel Fanthorpe, written in 1992, we read; She makes sudden leaps and bounds not easy for the reader to follow and also sees connections. . . . The towering edifices of her esoteric thought rest on very broad foundations. Through the ever-thinning veil of the observed material universe, she sees vivid glimpses of the eternal, invisible world. She writes with the passionate convictions of the pure in heart . . . She talks freely of cosmic wonders and mysterious multi-dimensional realities with a delightful franknesss and ordinariness, just as most people would discuss dinner menus or the price of petrol. . . . Her finely tuned instincts and exquisitely sensitive intuitions still tell her that something of immense importance may be happening at Rennes . . . she could be wrong of course but time will tell . . . .
A friend said of her; When I read 'Refuge' I felt that she was 'speaking metaphysically'...or, in other words, she didn't mean 'it all' literally. . .
And another said; When I met her she was an impressing inspired person and full of weird ideas and great to talk to. Her books are more or less kind of notes and theories that could change by the year. I would not take it all for granted. It's an esoteric universe where she plunged. In 1990 Elizabeth was convinced - she got the "information" during meditation she told me - that on full moon of September 1992 some space ships would land next to Rennes-le-Château and pick up passengers. I must confess that I curiously searched the newspapers days after that full moon. Then Elizabeth van Buren got interested in Mary Magdalene. She wrote about her spiritual experiences which included Mary Magdalene, who gave the Cathars a Great Treasure - the Book of Love written by Mary herself. It was this book that was smuggled out of Montségur, the "cathedral" of the Cathars where great religious secrets were held. The Book of Love is linked to the Gospel of St. John, and is claimed to contain the great secret teachings that Jesus confided to his disciple John. These teachings were so powerful that all hatred, anger and envy would vanish from the hearts of men and women. Divine Love, like a flood, would submerge the world and indeed, lead to a New World. This, as lovers of Mary Magdalene will know, is a theme that has been taken up by many spiritual leaders of the last ten years or so, and it has become the theme of a best-selling novel. But historically it is just not true. When Mary Magdalene was here in France, the Cathars, as history knows them, were not here and Montsegur was not built. It was Elizabeth van Buren who re-named the Grotte de Fournet beside the little river called Couleurs "The Cave of Mary Magdalene." "She loved that cave and used to take flowers there. She used to do deep rituals on the field by the fountain, driving things down into the ground," my friend Roibeard told me. 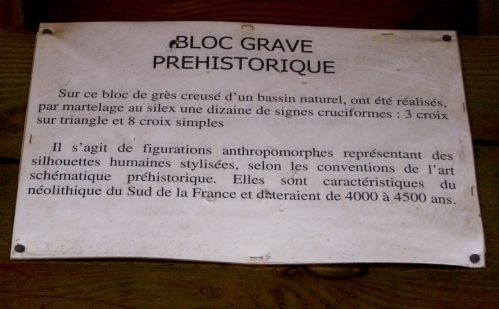 The local French people insist that this cave remains with its original name, but the English-speaking pilgrims who visit it are impressed by the "Mary Magdalene energy" that they experience there. It's not impossible that Mary Magdalene visited there during her stay in this part of the world they say . . . but I'm not convinced. 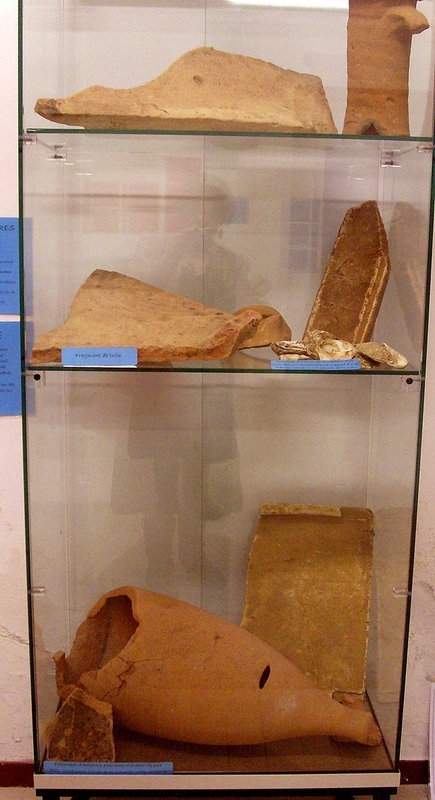 Not long ago a great stone was discovered near the cave and is now on display beside the Tour Magdala. The scientists have defined it as an ancient altar stone, perhaps used by the Celts, perhaps 4,000 years old . . it has scratchings on it of crosses . . . and the legends of Mary Magdalene grew and grew. So - rest in peace, Elizabeth van Buren. You were loved and respected and you probably never thought that the dreams you had would be taken so seriously by other "searchers for truth." Then I discovered a little more . 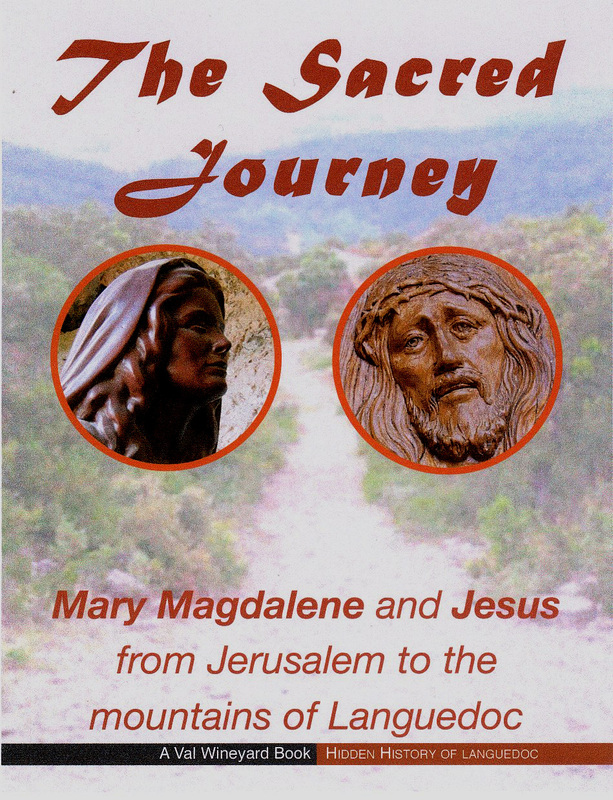 . .
Lucinda from the States had bought my book "The Sacred Journey" from my site about Mary Magdalene and messaged that she wanted to meet me! So I went to Couiza on the bus where we met up, then continuing to see some of my Occitan friends at Rennes-les-Bains and have lunch at the Place de Deux Rennes. Then we continued to Bugarach to do some further explorations on "the route" as described in my book. The Chateau at Bugarach is now being restored; This was a Celtic oppidum in early Roman days and I was convinced by the well that Mary and Jesus had once stayed there. (Above ground the well has been renovated, but not below ground.) But which way did Mary and Jesus come, from Cubières to the east? Today's D14 didn't exist in Roman times. So we found the road that did! We took the road down behind the château and then turned right. This put us on the old Roman road - after about a mile it meets up with the D14 again. Then we continued along the track until it met with today's D14 about a mile away. It was a lovely day and a beautiful walk. I could imagine Mary and Jesus travelling this way and I even found some tiny bits of Roman pottery, just shards, but they were Roman. Much more details are in my book, of course. 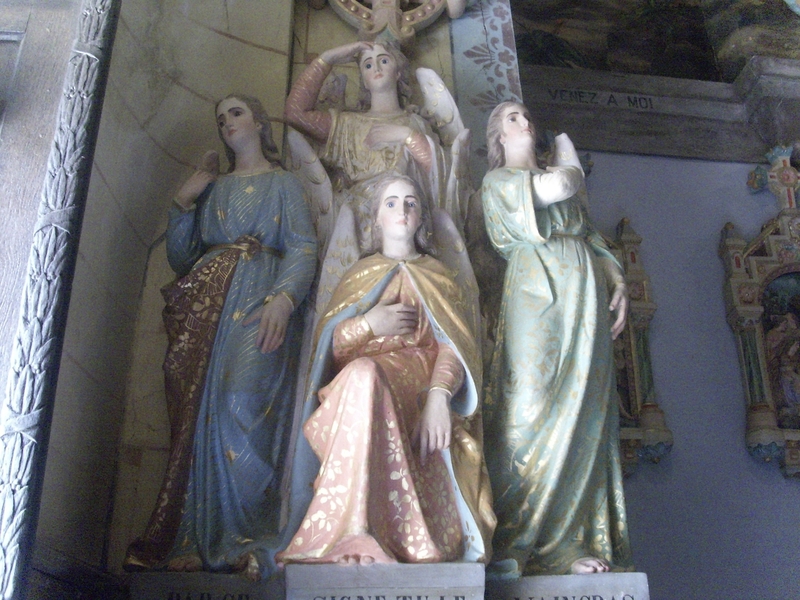 I had been writing so much about the possibility of Mary Magdalene and Jesus coming to Rennes-les-Bains it seemed I also ought to write in detail about their journey . 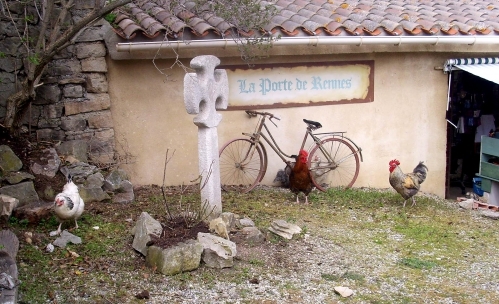 . . then I thought this might interest many more people than Rennes-le-Chateau and Rennes-les-Bains fans, especially as I thought Mary and Jesus had travelled across the Corbières in ancient times, visiting many tiny villages and travelling on Roman roads. Then I thought people needed to know about my writings but also about Mary Magdalene and Jesus as historical figures. They lived in the Roman Empire (all the known world was the Roman Empire at that time) and so they travelled on Roman roads. Through belonging to various historical associations here in France I know about the Romans and their roads. If this interests you, please click here to discover my research! Meanwhile, did you like this article? Why not write a comment in the space below? 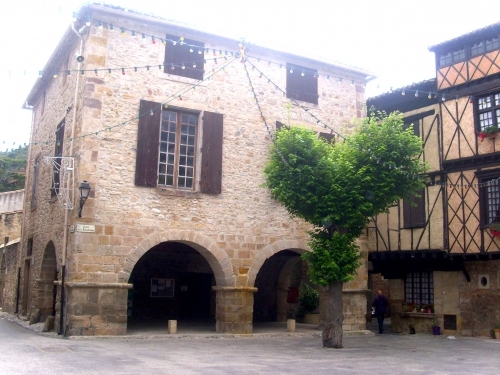 This favourite place of the "Rennies", where Bérenger Saunière was once vicar in the church, is situated on the D118 between Limoux and Couiza. One day I took the bus to meet up at Carcassonne with Tina from Conneticut, that was a magic day. Here a picture I took of her, out of focus I know, but it's got a certain atmosphere . . . 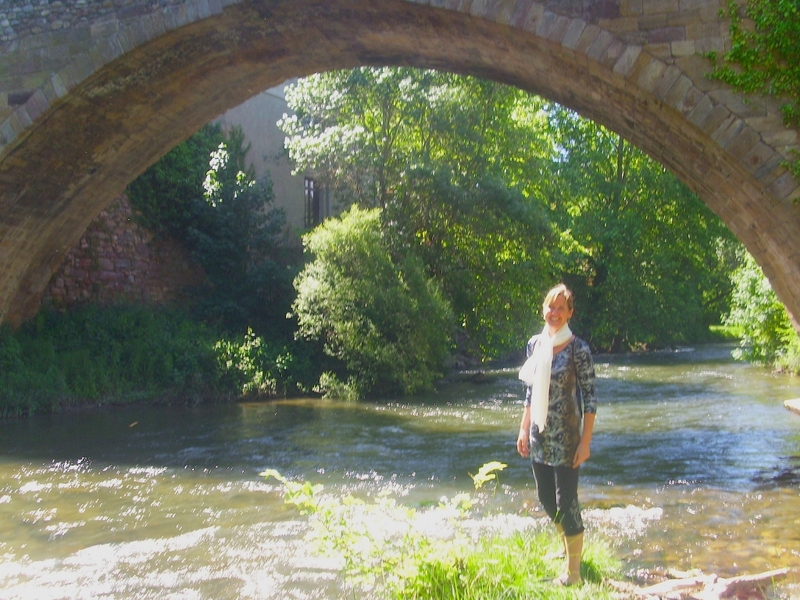 It's under the bridge, or nearly, at Alet-les-Bains. Then we went for lunch at the Bishop's Palace . . . The grounds are open to the public and it is a very peaceful place. Food's good but the wine is better! 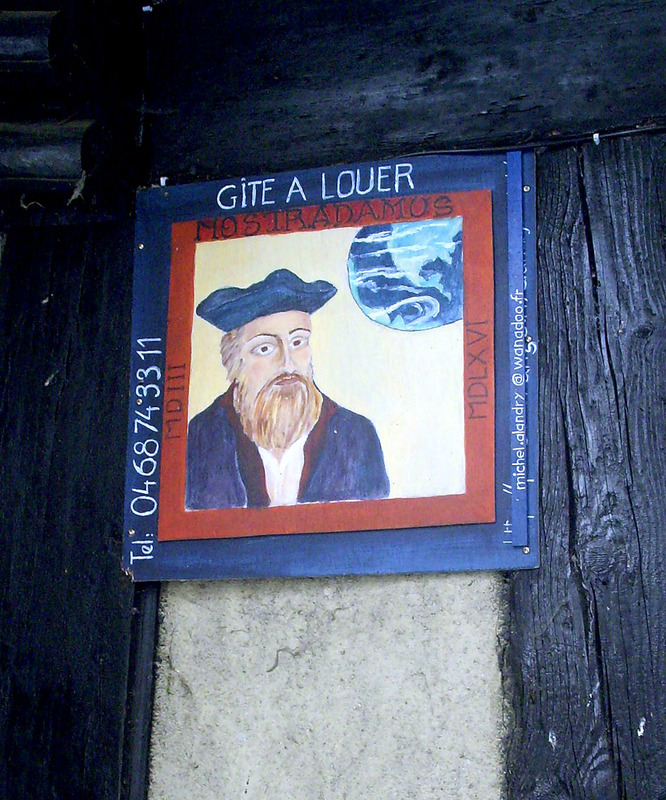 Just to wander around the streets with their 16th century half-timbered buildings is a delightful experience in itself, and one discovers many hidden gems of history. Sixteenth century streets . . just about wide enough for two people or two horses. The six main streets make a star pattern in the centre of which is the place de la Republique, with its arcades and its statue of Athena. 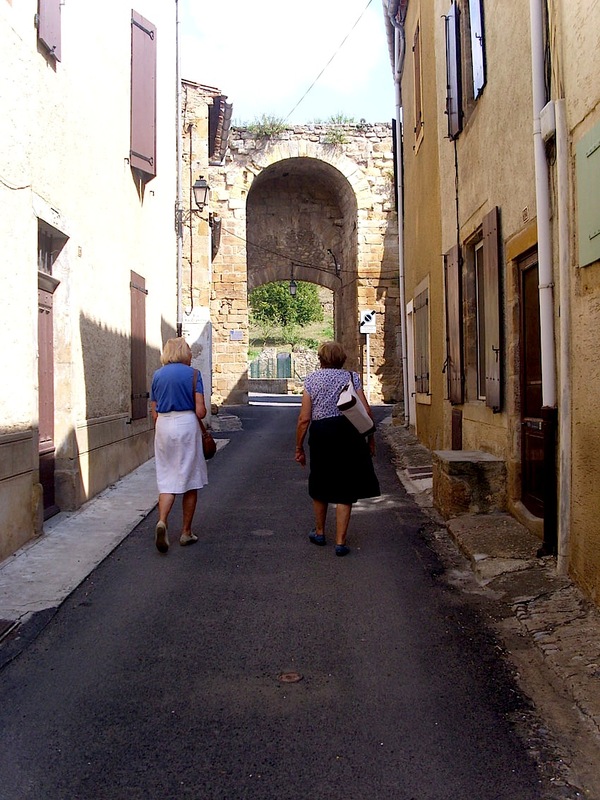 The town centre of Alet-les-Bains is well known for its well-kept town houses of the 16th and seventeenth centuries, many with beautiful stone gateways, carvings and archways. The main square in the centre contains all the luxurious buildings - one of which used to be the Mairie, the one opposite it is for sale! - that belonged to the wealthy burgers when Alet was important and also masonic. 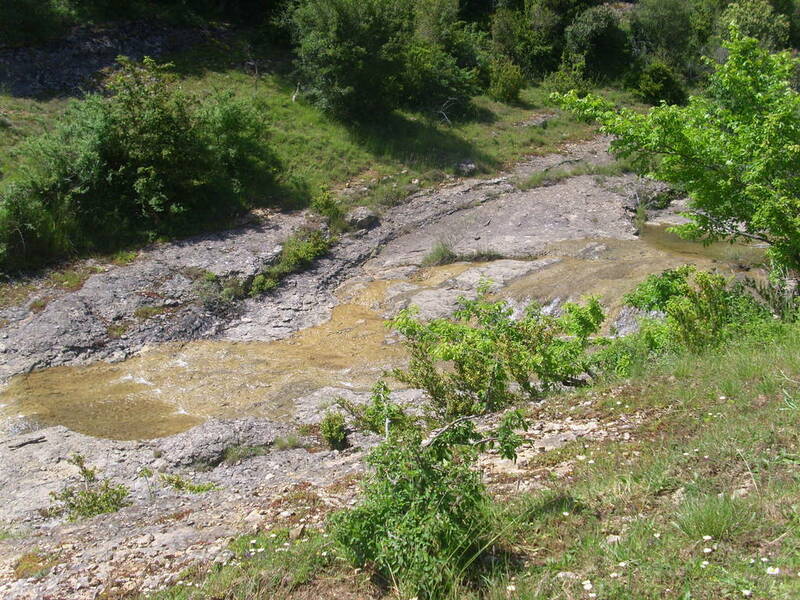 Meanwhile, the High Valley of the Aude, as with the Corbières to the East, is full of natural springs and underground rivers. There used to be a source beside the old Cathedral - when I first visited there in 1990 there was a notice beside it, saying; drink at your own risk! Eventually it was legalised and a bottling plant set up. But for some reason the local people protested vigorously I heard, and the plant was closed. The statue in the centre of the old town is also over a running spring; this is the same water as you can find beside the cathedral. 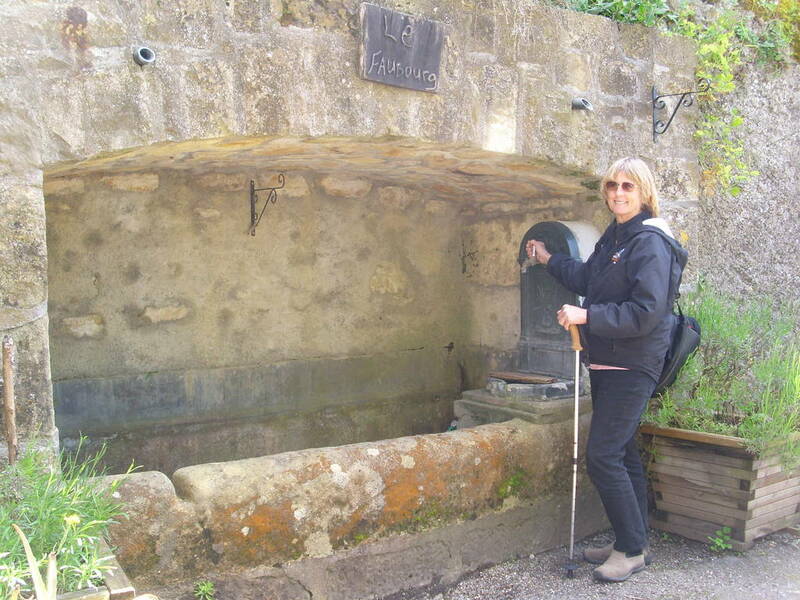 But the most popular source is the lavoir. 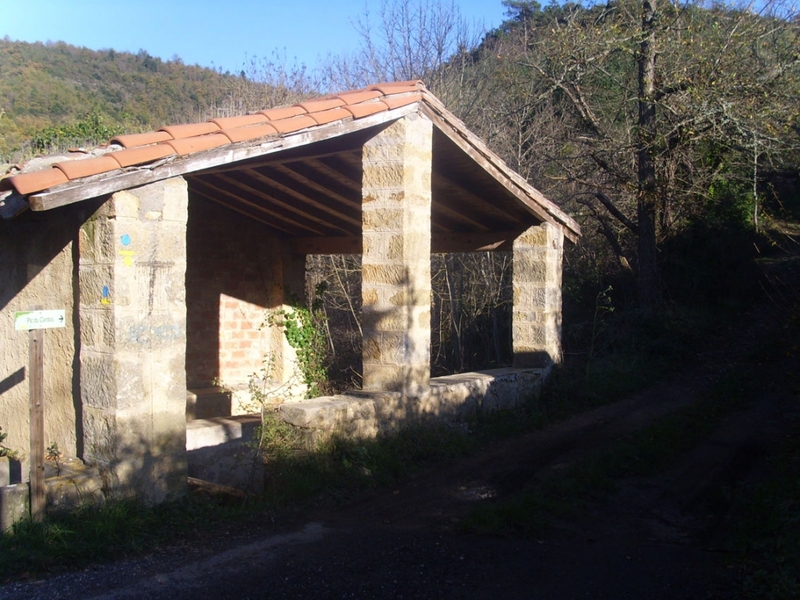 To the north of the town, this is the lavoir, where the women used to come to do their washing. There are lavoirs in many towns of this region. Especially for the women, they were also a meeting place where news and gossip as exchanged. 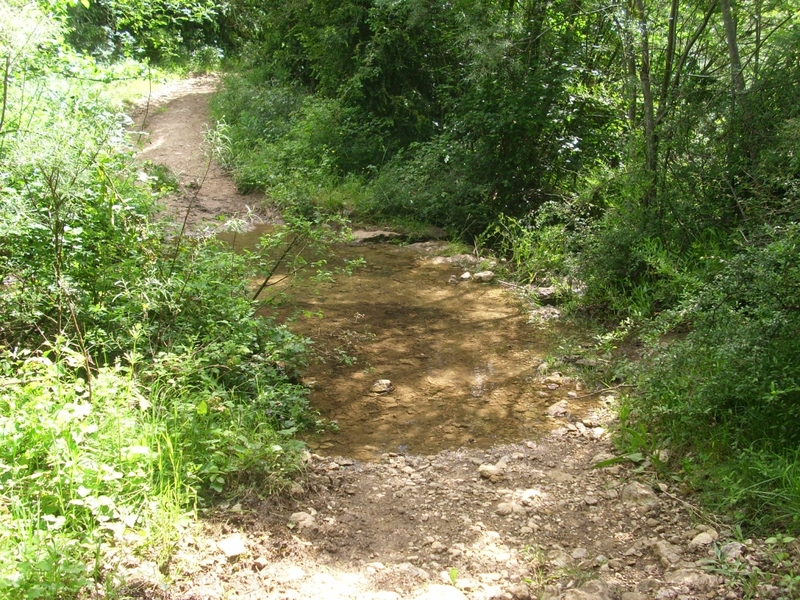 The water runs continually. It looks as though the building has been roofed just for protection, and the stone walls have been maintained for hundred of years. 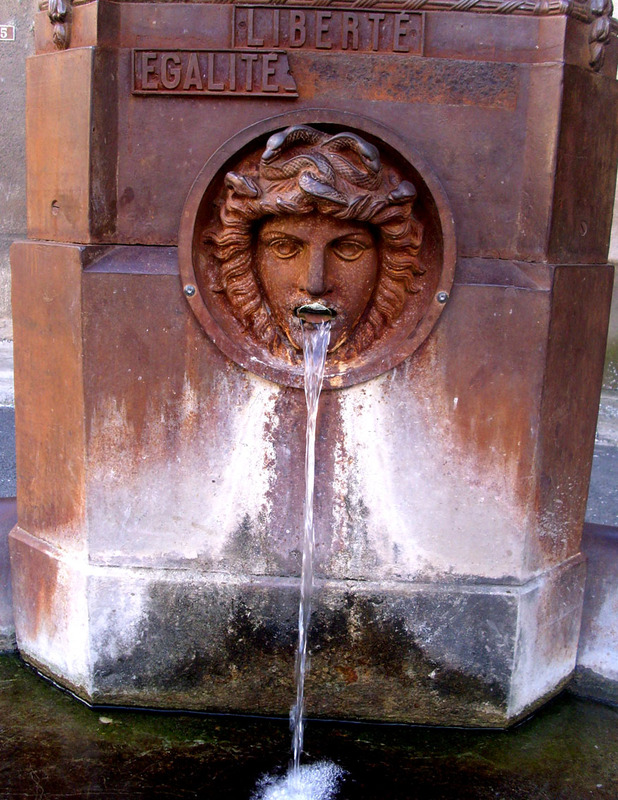 We knew in our bones that this source of water has been used since Roman times. The locals still come to fill their bidons and waters bottles, for this is good drinking water. I talked for a while to the couple there. 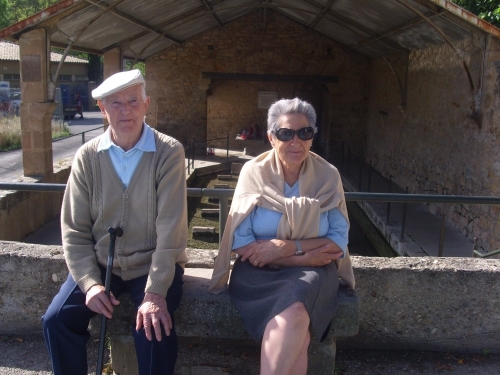 They had lived in Alet-les-Bains all their lives, and they told me about life in the village before the advent of municipal water in the late 1960's. 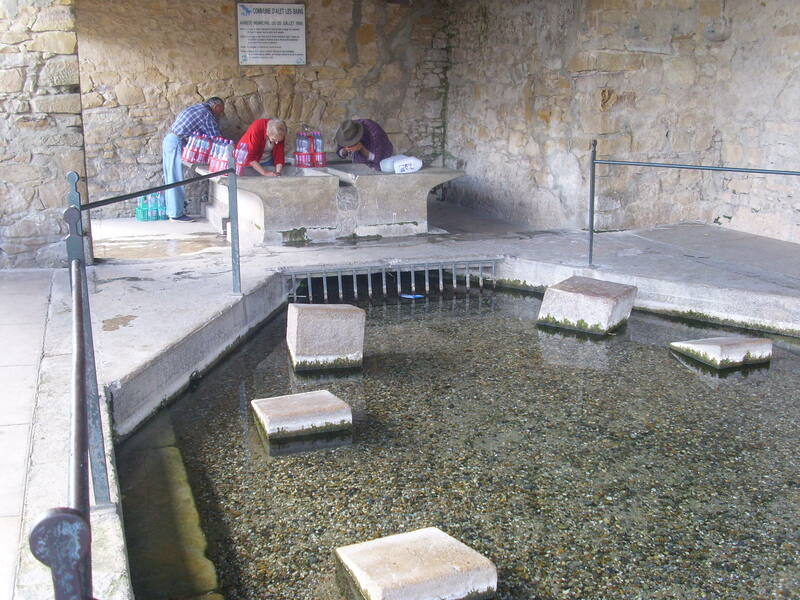 People came to wash themselves and their clothes and to take home the good fresh drinking water. The place was busy all day long. And it is all completely free. You could live without paying water rates in Alet; some people come in cars from other villages,their boots full of plastic containers. Meanwhile, the water never stops running and it feeds the swimming bath next door. 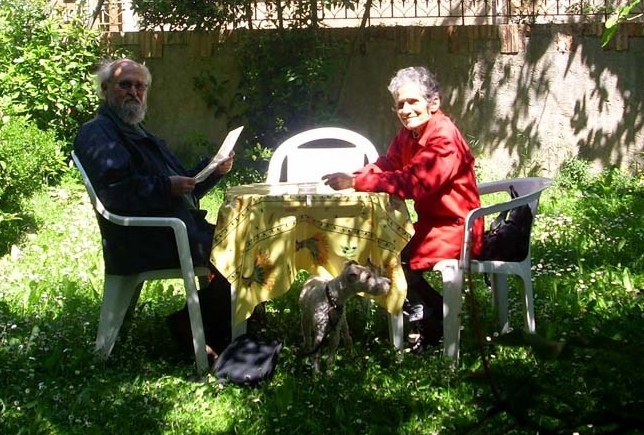 They posed for a portrait, both in their eighties. They drink this water for longevity! Everything else you never knew! As a result of my interest in the region of Rennes-le-Château and it's mysteries, I have long been exploring other villages and hamlets in the region, leading to the conclusion that the whole area resonates with - what? Something very special. Hard to put a finger on, perhaps the way one mystery always unfolds and reveals another. Anyway, I wrote a book! 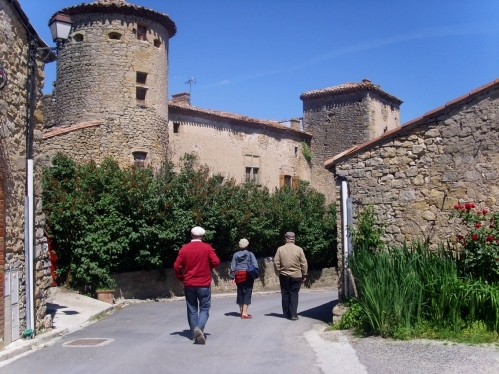 Alet-les-Bains is situated between Limoux and Couiza in the High Valley of the Aude. It's a ten minute drive to and from Rennes-le-Château. It has a by-pass so maybe that's why so many people miss it. But turn off to find yourself in another world, one that played a prestigious role in the history of the region, being a major trading centre in Celtic and Roman times, a religious centre in the Middle ages, a healing centre and a masonic town in the late 19th century. 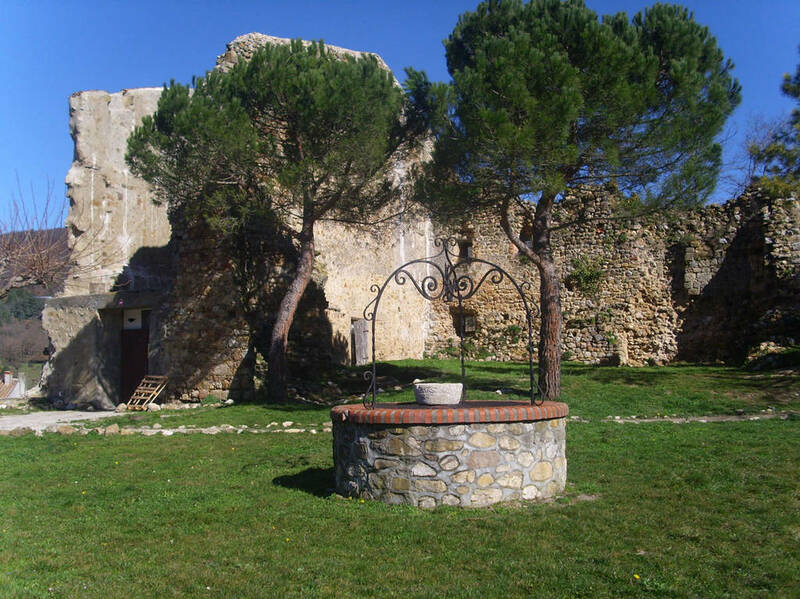 It was also the place where Bérenger Saunière had his first appointment as a priest, he was the Assistant Vicar there nefore he had his own parish at Le Clat, after which he came to Rennes-le-Château. As you wander around the village centre, with incredible 12th century stonework and 16th century half-timbered houses, you will start to see strange signs everywhere and unusual statues that will send you on a fascinating voyage of discovery, much more pagan and heretic than one would expect from a cathedral town. I made this book an unusual guide to - the unusual. Chapters explain the Celtic trading centre on the River Aude, the Roman road over the mountain, the Black Virgin in the church, the burials under the cathedral floor, the man who told the future, the American who gave his life for France, the man who worked as a cook for the Tsar of Russia - and maybe even the place where Jesus and Mary Magdalene passed so long ago. 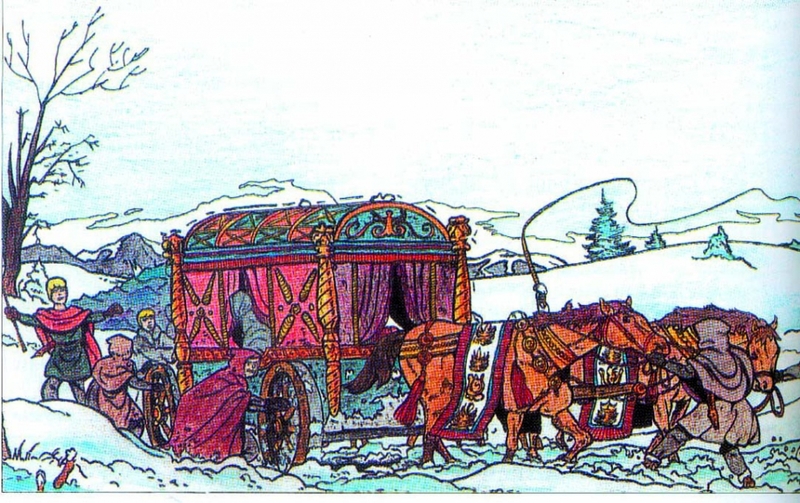 The book is illustrated in colour throughout. It is also available on Amazon.co.uk - click here for details. For much more about the secrets of Alet les Bains - click here.